Here is my new 2013 Optimus Ti. 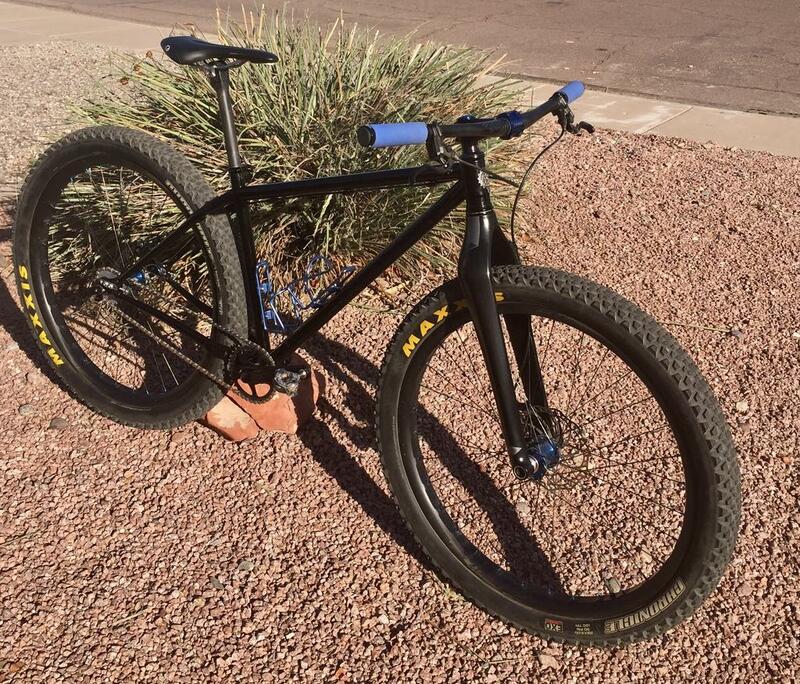 Build this up this past month, and I have to say I love this bike. Here is my Verhauen, just built it up this past weekend. 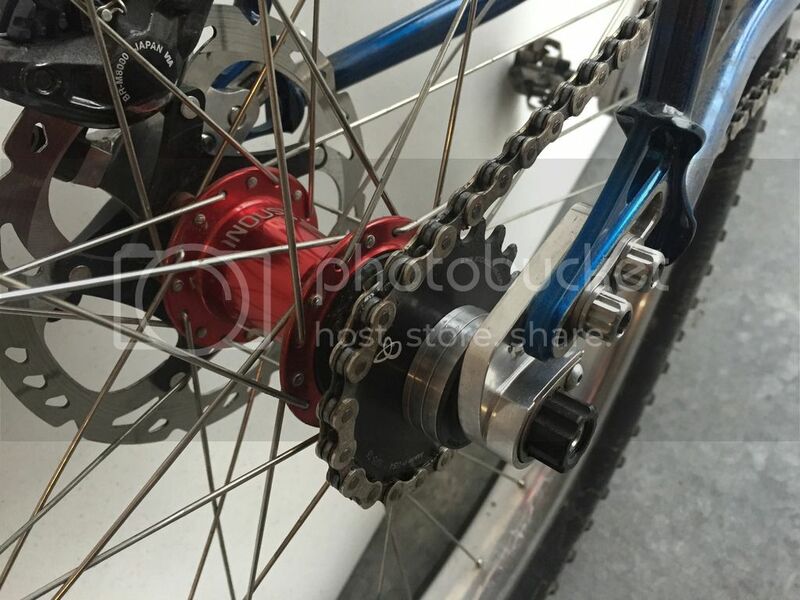 Swapped most of the drivetrain over from my last bike, picked up some Stans Arch EX wheels (needed the 142x12 & 15mm compatibility my other wheels didn't have) and an X-Fusion Slide 29 from Vassago as well. 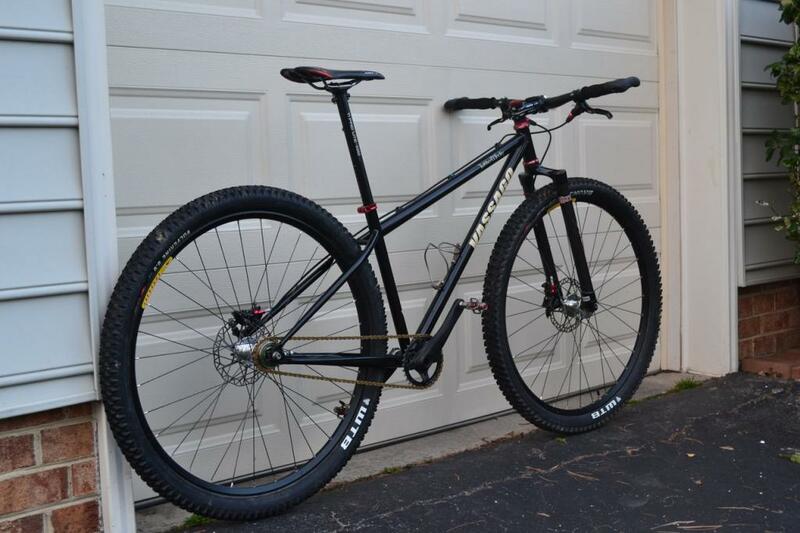 Build went together slick, bike handles so well and geometry is dialed (for me). Surprised that there are only a couple posts on here. Guess most guys don't venture outside of their normal thread sections. Love the Opt Ti and seriously looking at doing the VerHauen in the next year if I don't take the plunge and go custom with a CocoNino. Not much changed on mine in the past year or so. Been thru a couple different brake set ups but running XT's now. On a different bar as well, Answer 720 w/ 20 sweep. Actually love them. Not as severe as the Mary's and way lighter! Carbon of course. Swapped the seat out for the SLR that was on my road bike and I think that's about it. Sold my light race wheels because I was just too damn paranoid about riding them and having them break. 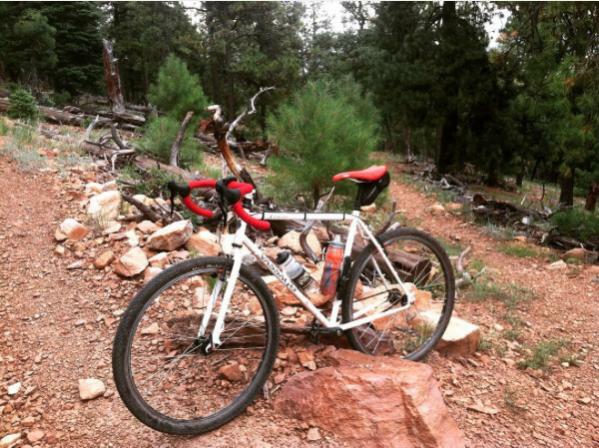 Been on the same Velocity VXC w/ White Ind hubs since the first day I built this bike and they are still rolling strong! 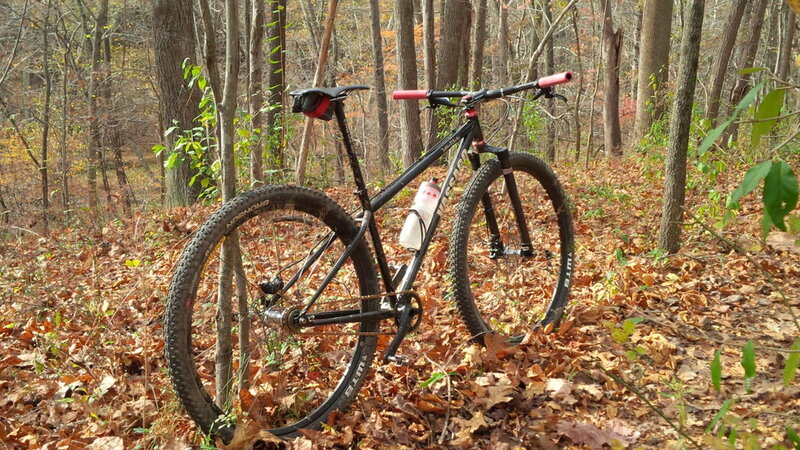 Pic of the bike with all the fall colors was taken last week (pink grips are off...was easier to slip them on to try the new bar but since I like the bar I put my black ones on). 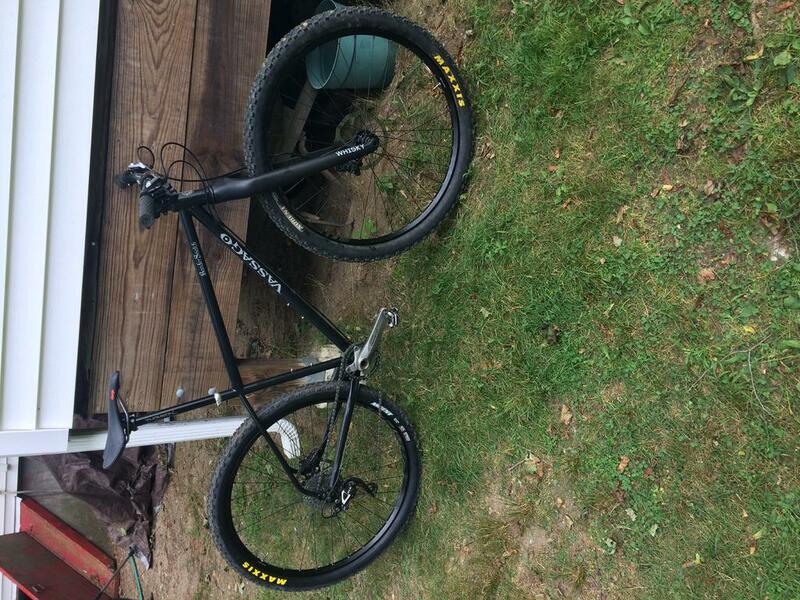 Other pic is of the bike early spring with my other wheels on it and what not. Here you go, my second Vassago! My old Jabber. Still my favorite bike! Here's my Jabber in the wild. Been my favorite since I built it up. It has ridden with me in several states now. 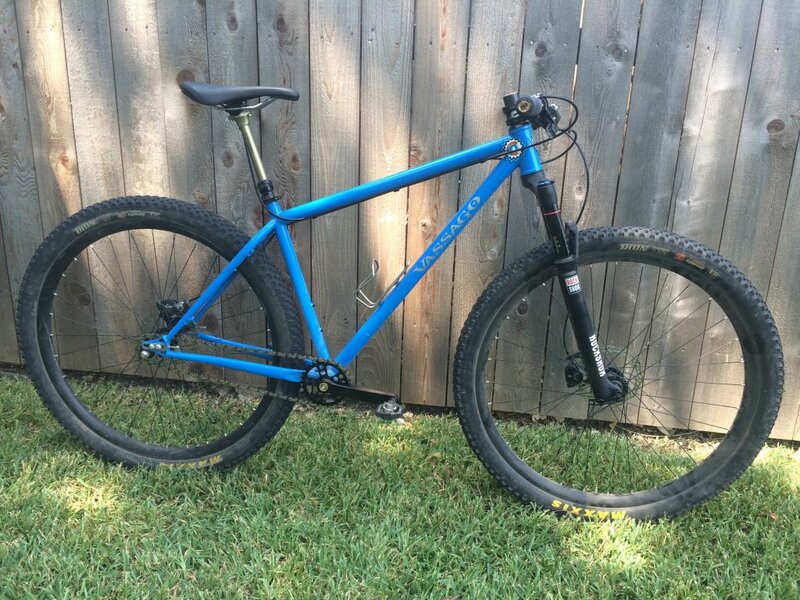 "Those who wander are not always lost"
Just picked up a Bandersnatch, going to run it 1 x 10 with a rigid front fork and 29+ front tire for a little cushion. I'll post pictures when I get it built up. The Boat or The Bike? I just met and rode with a guy that has a few Vassago's. He is really quick, so they must be fast bikes. He really loves his. 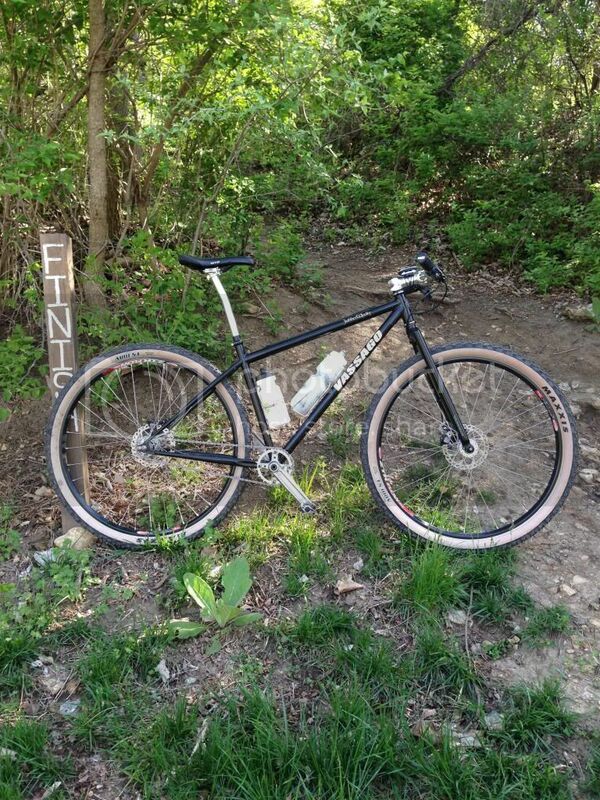 He had a carbon prototype hardtail. Not sure the model. I didn't know these existed before a couple weeks ago. Figured I would give my post a shot on this thread rather than starting a whole new one. 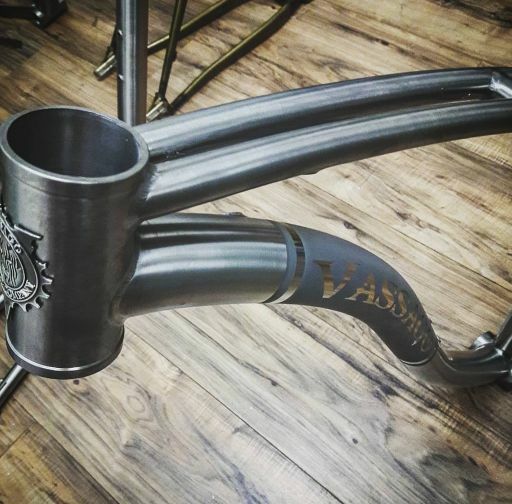 I've been lurking all the Vassago/Verhauen threads for the past few months and have become quite the fan but I'm getting very impatient with the wait time on their frames. I would like to hear from any of you Vassago owners. Any customer service issues etc.? Just put some Frequency i23s on it with a 2.2 front and rear. The wide rims turned into a 2.25. 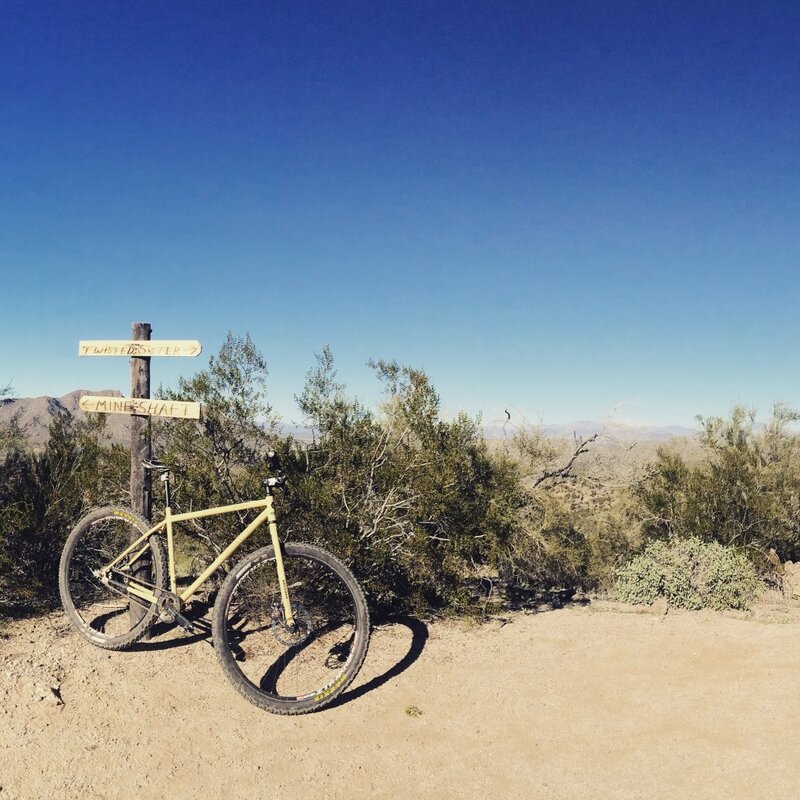 Please donate to IMBA or your local IMBA chapter. 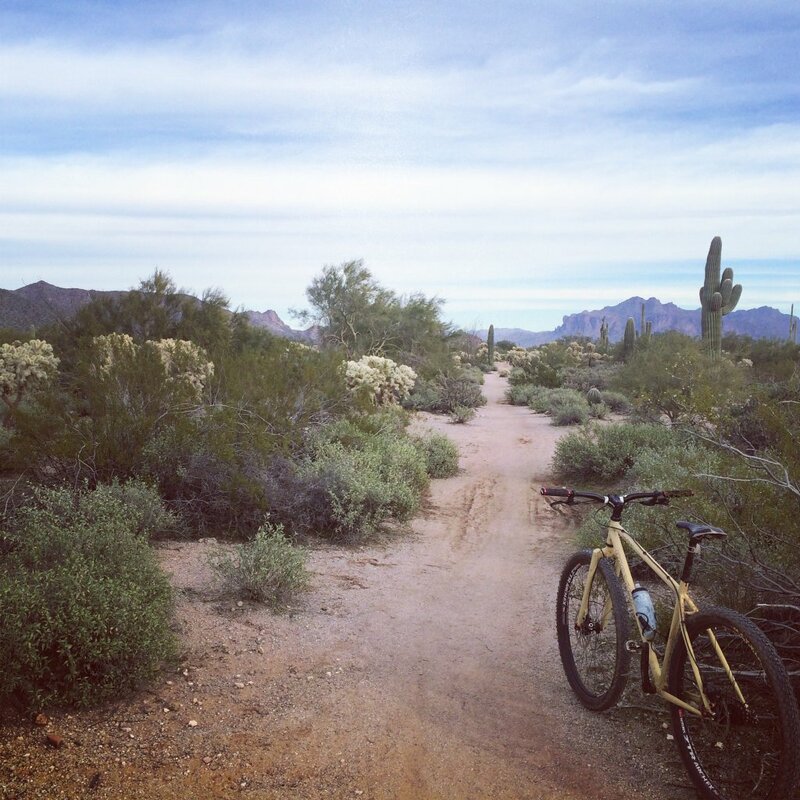 It's trail karma. 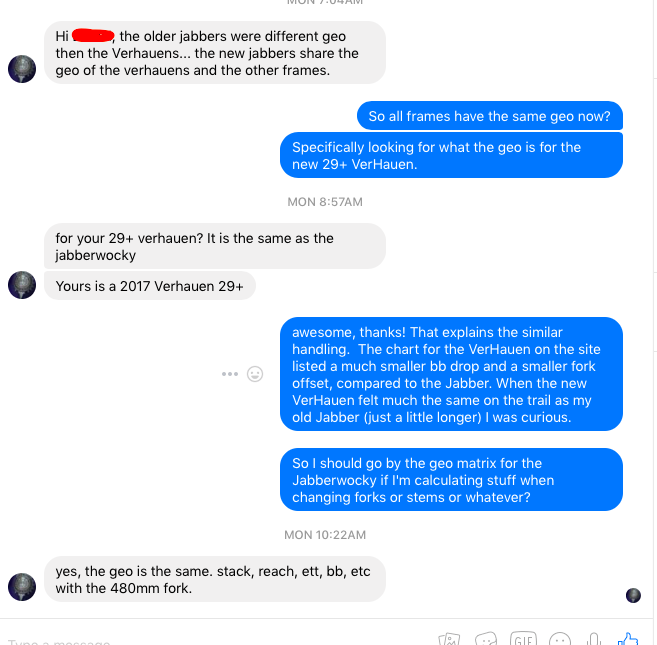 Didn't think it could get much better than my Jabber... Until I got my VerHauen. Love my Vassagos! 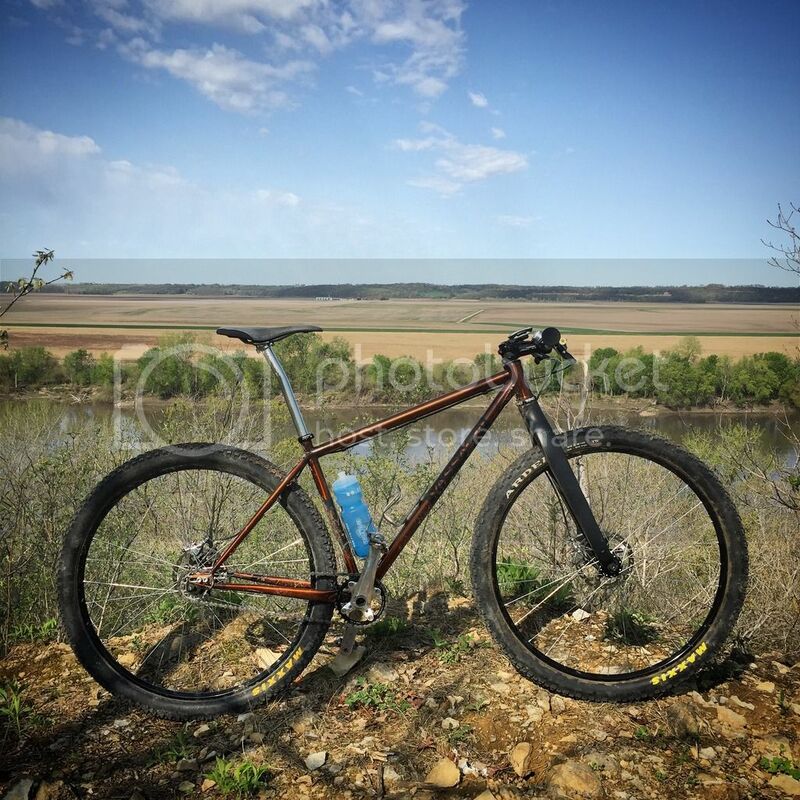 our local midwest bike forum... check it out! I am considering the same build. Did you do this? If you did, would you mind sharing? 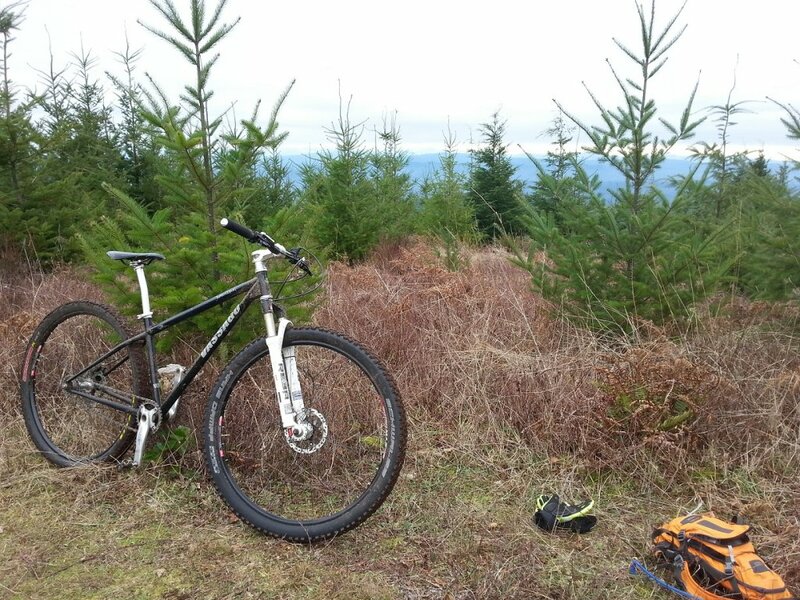 Sorry, been so busy at work that I've been out of the MTBR forums for a while now. 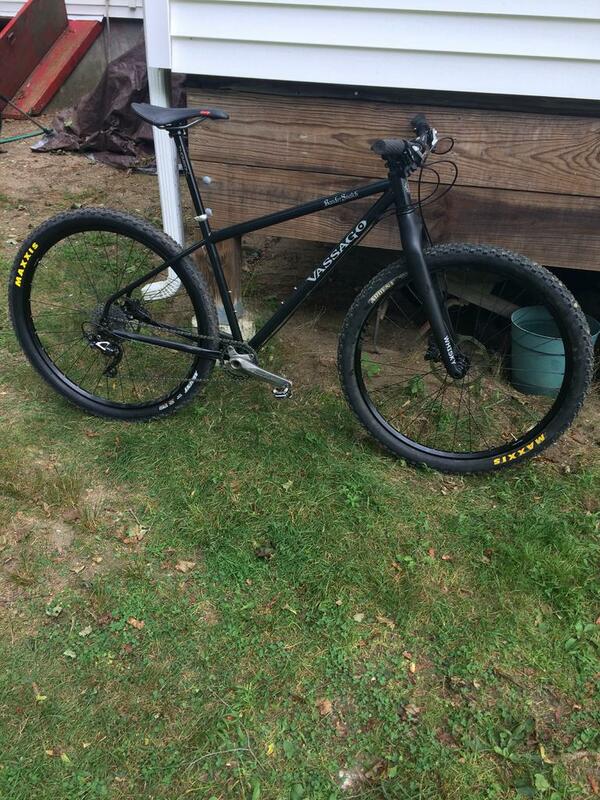 Yes I added a 29 x 3.0 front tire on a P35 rim. The Vee Rubber tire actually ended up about 2.8" in width with tons of volume. It certainly did give some cushion but it always felt weird to me. 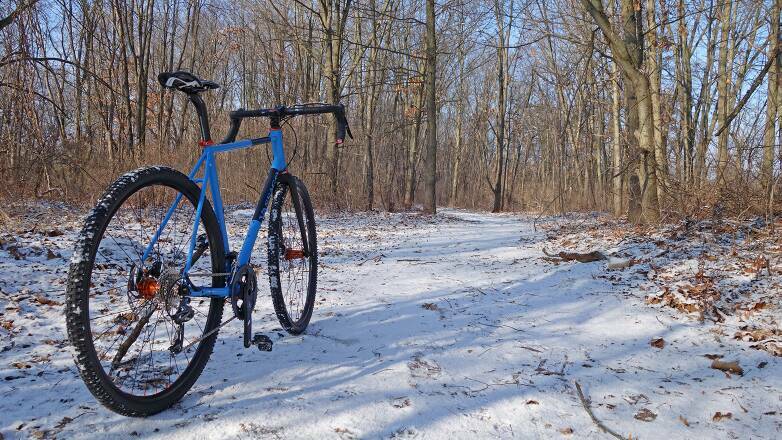 I could never get entirely used to the fat tire feel up front. I recently purchased a Manitou Tower suspension fork to run up front and intend to install it this weekend. 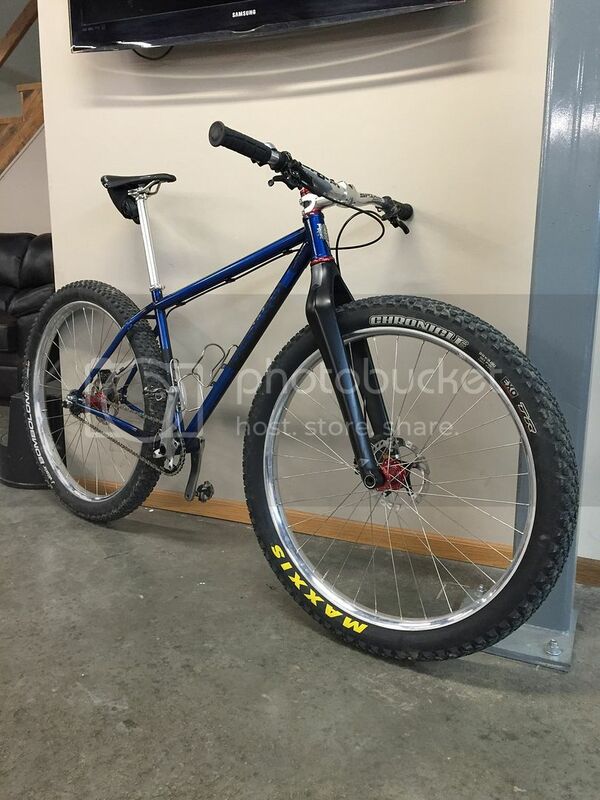 If you're interested I might consider selling the Surly fork and Vee Rubber tire together. 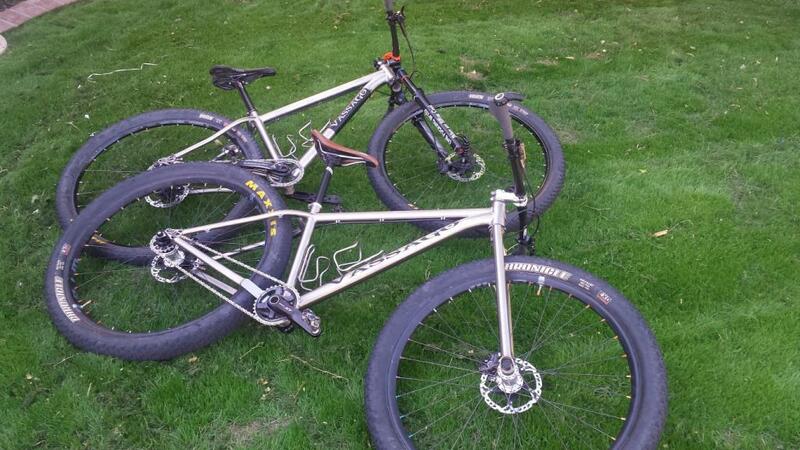 Both are in excellent condition and there is plenty of clearance in the KM fork with the 29+ tire. I saw that you've run the Knard on both your Bander and Jabber, what are your thoughts on that setup? Verhauen from a year or more ago. Some updates since then-need some new pics! 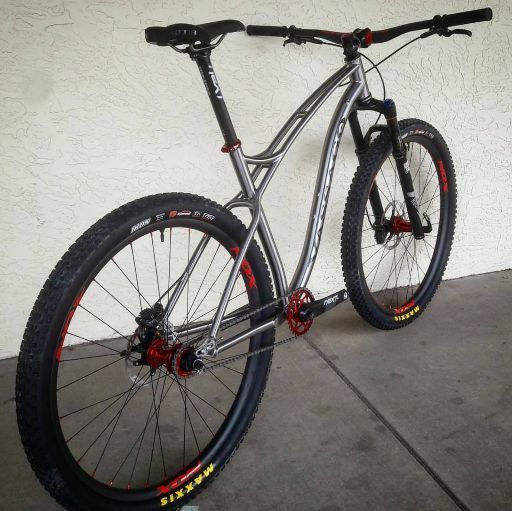 Loved the 29+ front end on my 29ers... So I decided to pick up a new 29+ VerHauen frame to replace my old VerHauen... Couldn't be happier with it! Just need to cut the steerer tube. Tom said in a few weeks. 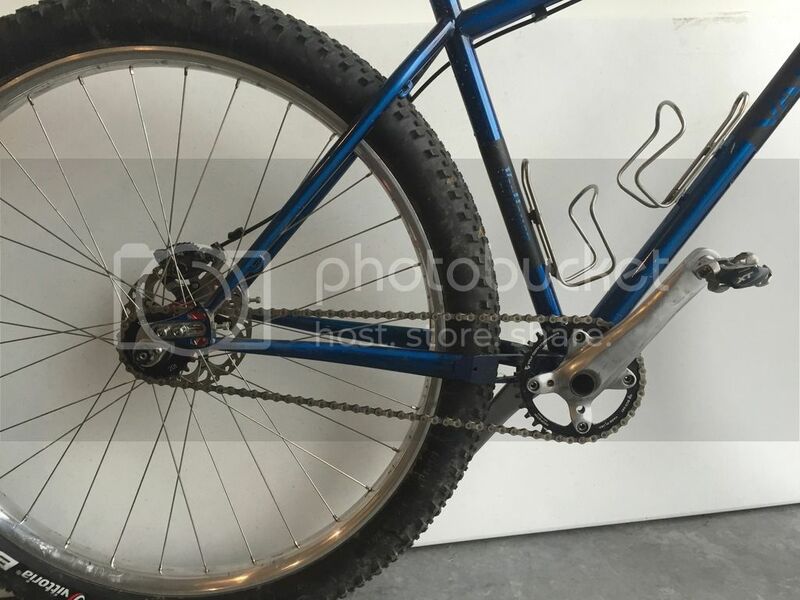 Jabber with Sliding dropouts and room for 3.0 tire! 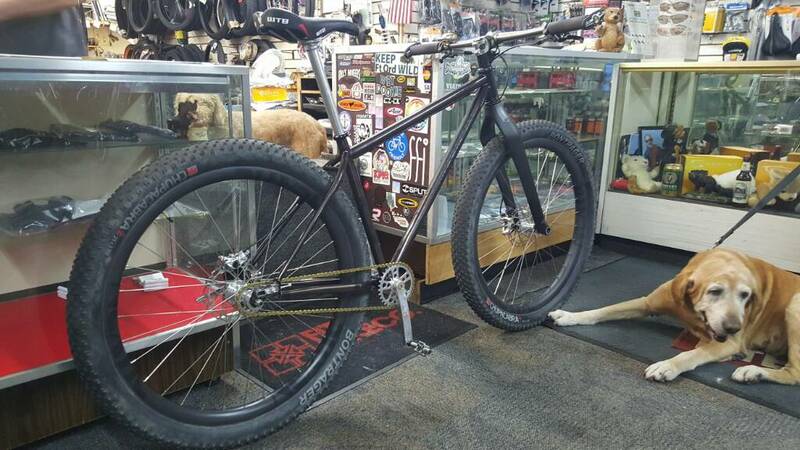 Curious, has anyone tried 27.5+ on a VerHauen? Just ordered a 29+ Verhauen and Whisky #9 fork today. I'll be transferring all of my parts from my Krampus over and can't wait! I would be interested to know this as well. Theoritically should, but it does have quite a high BB drop (66 mm). Crap, never posted any finished pics since I've been enjoying it so much lol. Here are a few pics of the finished build. Last edited by flyinmike; 02-28-2016 at 06:33 AM. I've been saving my pennys for this frame. 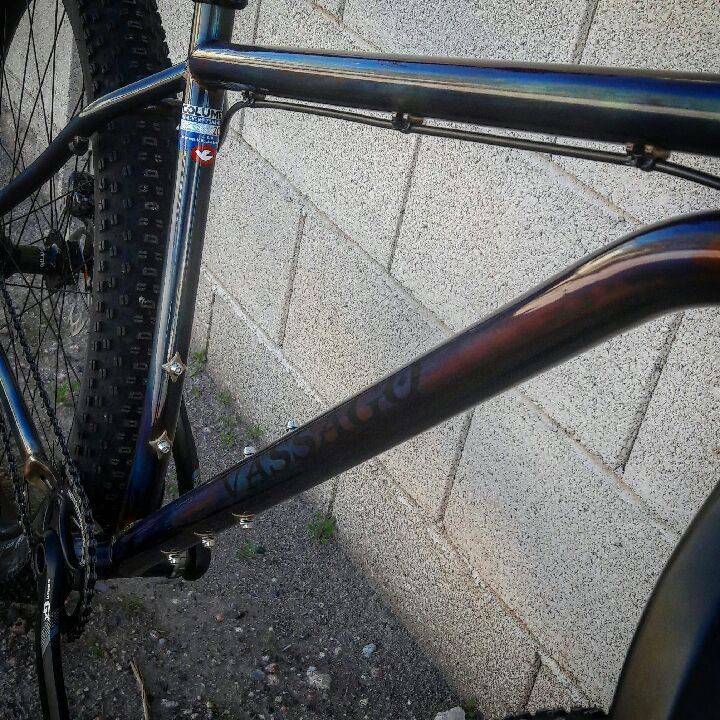 Saw your bike on FB when Vassago shared it. How do you like the ride? How's the fit? Haha! 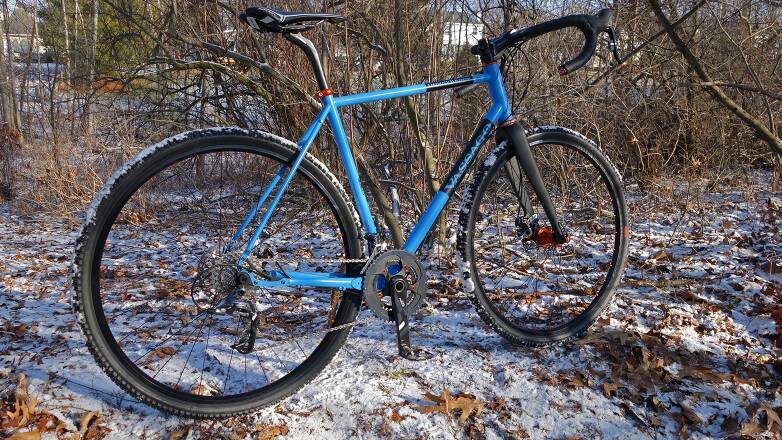 I believe the final color had to be inspired by the custom VeHauen that Vassago repainted for me back in May. My inspiration was Volo's Rebel Blue color on their Polestar edition cars. Looks so good! Oh man...that Donnybrook is sweet! Any more news on 2017 release/site update? 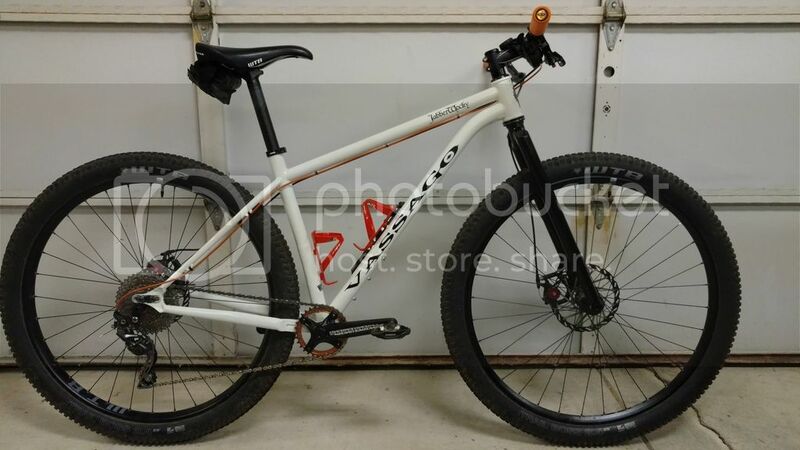 I am waiting on my Carver Gnarvester 29+ frame. What wheels are those? I still don't know which wheels, but I do like the looks of yours. I plan on the Chupacabras tires. Nice. Gnarvester is awesome and I almost got one. The wheels are 40mm Nexties laced to Hope Pro 2 hubs. 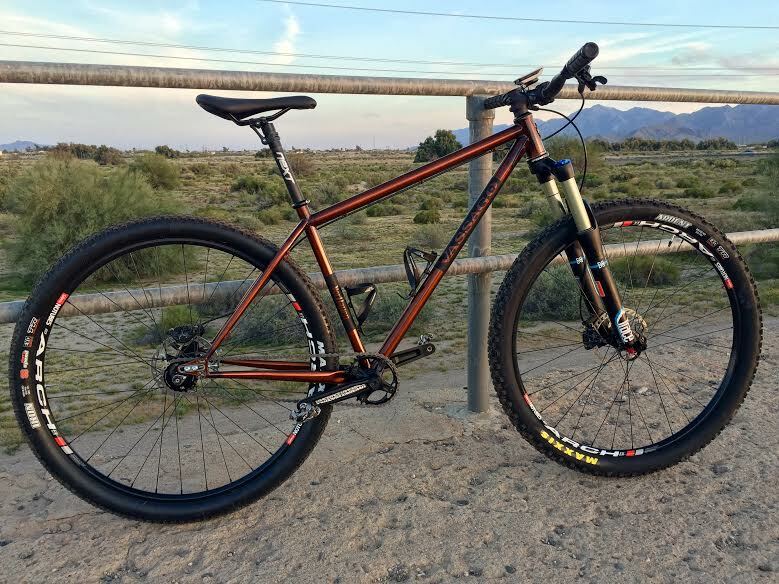 I really like the Chupacabra's, I plan on trying out some Surly Knards next since my local bike shop keeps them in stock. Last edited by paleh0rse; 02-04-2017 at 10:36 PM. Ask him about the Jabersnatch? No problem. The updated Verhauen and Optimus frames are my own primary concerns, but I'll ask him for whatever info I can get on all of the above. 2017 Verhauen - 2 weeks. 2017 Optimus Ti - 4 weeks. Mooseknuckle - forgot to ask. Jabbersnatch - not gonna happen. The new Verhauen and Optimus Ti have identical geometry measurements. 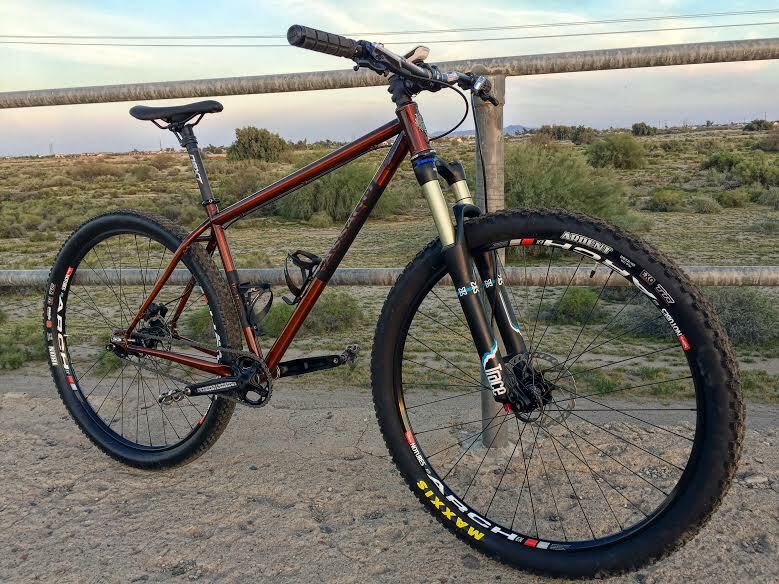 Each maintains most of the same tube length measurements as 2016, but they now both have 148mm boost spacing and 430mm chainstays that can safely fit 27.5x3.25" tires. 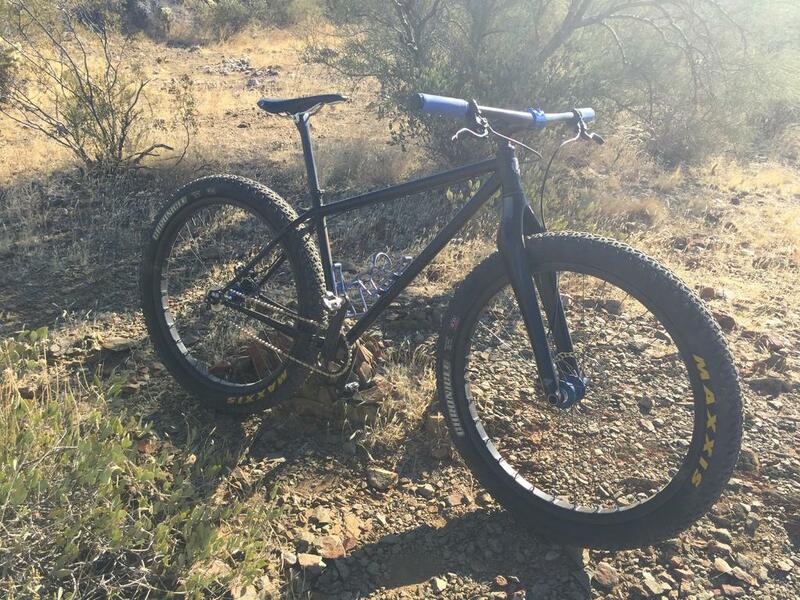 (I forgot to ask about max 29er tire size because I was too focused on my own build. Sorry! I'll follow up on that question tomorrow). Last edited by paleh0rse; 02-06-2017 at 10:57 PM. I really really like that heat-treated look. It's very interesting. I've always kind of wondered what would happen if I stripped and clear coated a 4130 frame like a JabberWocky. 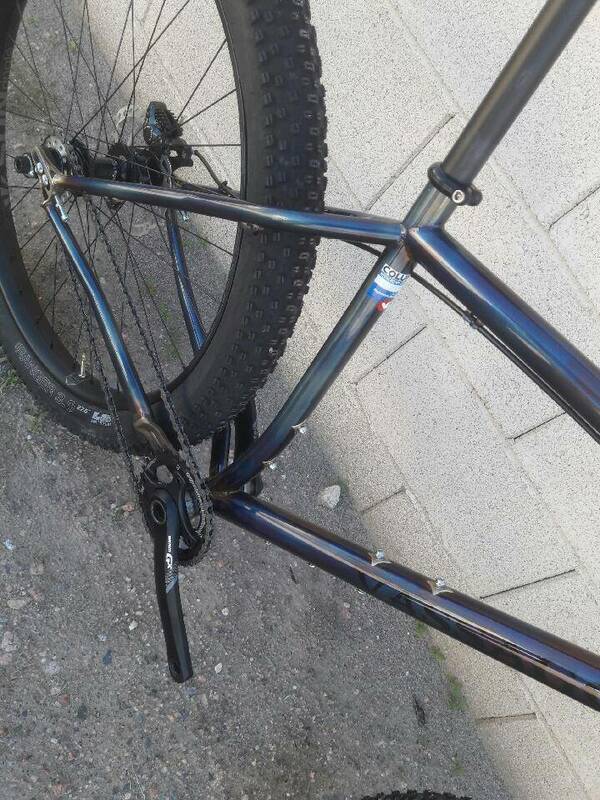 I once bought a wheel set from a guy that took a torch to his ti frame, to similar effect. He actually claimed it was a prototype (or some story) Optimus, but he also said a lot of stuff that seemed odd. 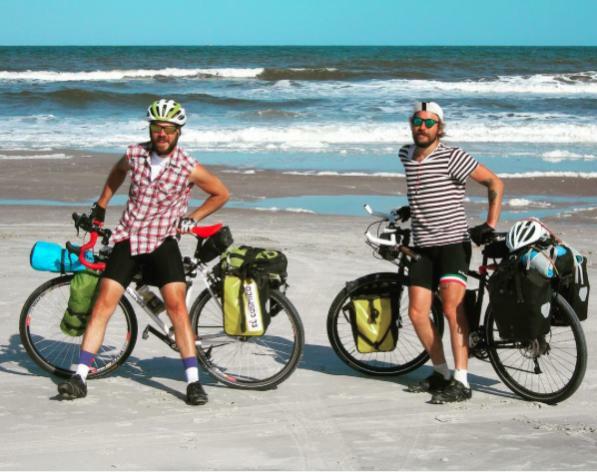 He also only rode his torched ti singlespeed on the road and it was geared like 38x14 or something. He showed me pics of it. 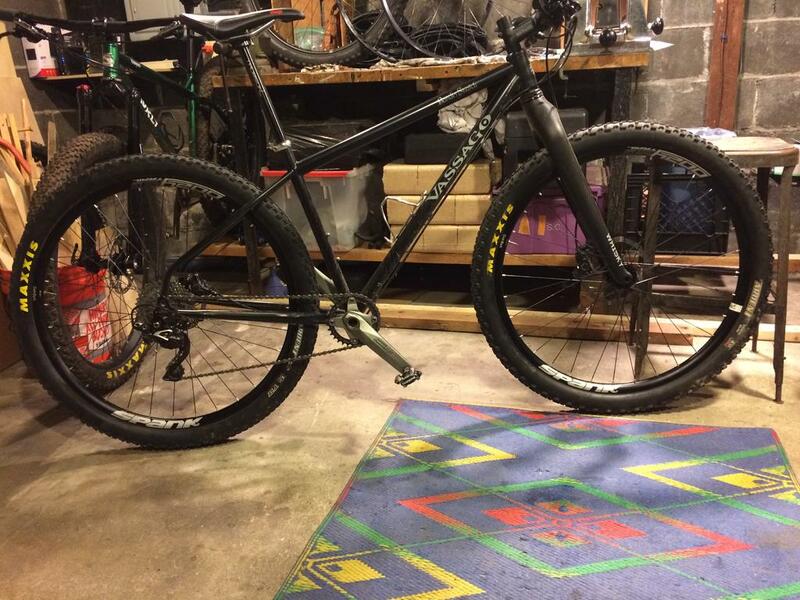 Normal 29er tires and 120mm fork = 69 deg HTA. 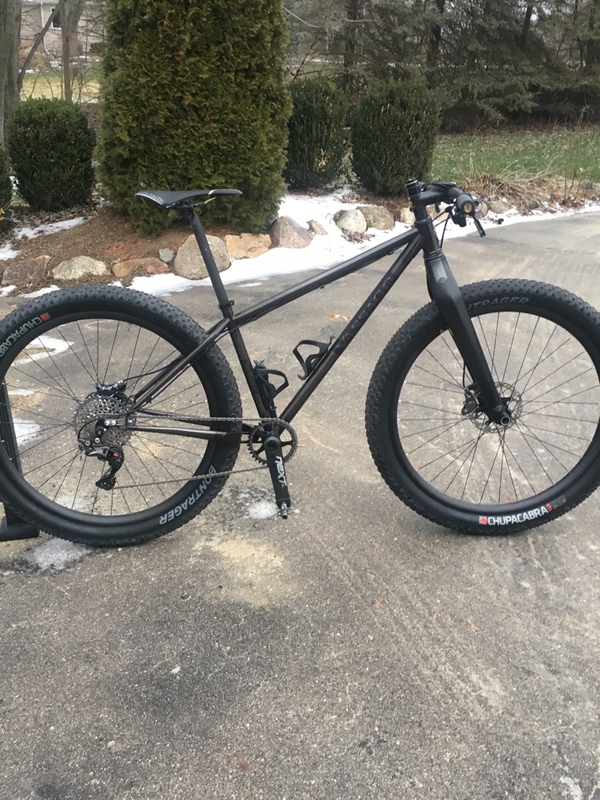 27.5+ tires and 130mm fork = ~68.5 deg HTA. BB drop stays the same with either of those setups at 56mm. With boost spacing, I'm pretty sure it was intended to clear a 3.0 tire, but can't say that for certain, just seems logical. There's about 2mm of clearance, probably not advisable to leave it like that, a CS of 430 is gonna rub. 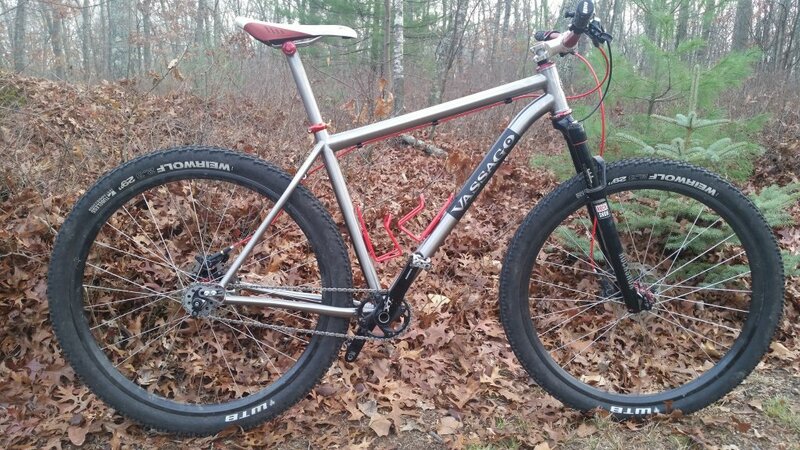 I still need to get clarification on fork travel recommendations (or A2C) for each of the possible wheel/tire combos. If or when I get that info, I'll be sure to post it. And these should be available when? Two weeks? Yes, the first batch of new Verhauen frames is arriving in ~2 weeks. 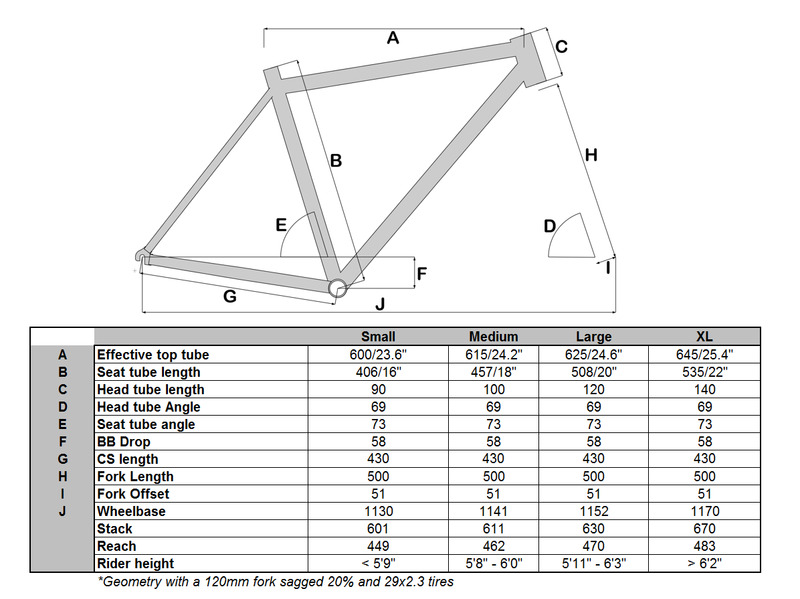 The first batch of Optimus Ti frames (same geometry with titanium) should arrive 2 to 3 weeks after that. There is a waiting list, though, so you should probably give them a call and talk to Tom if you're seriously interested in grabbing one from the first batches. no news on the new jabbers? last i heard they were 3 weeks-ish away. hoping to get a kick down from some of my industry bros on the wheels. 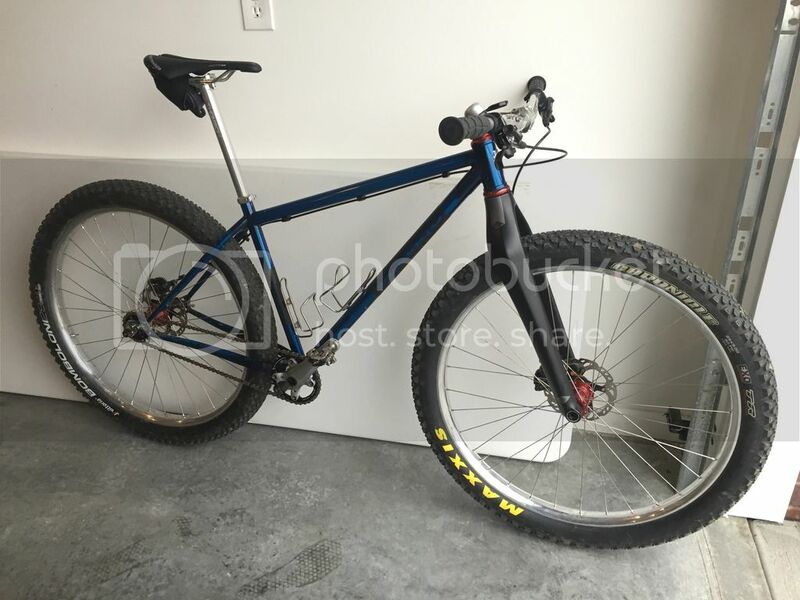 that just leaves frame, fork, headset. 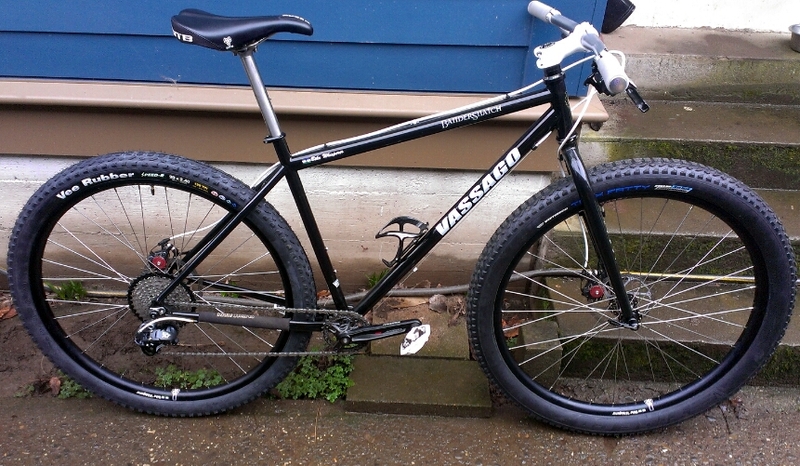 i'll scoop up a King from Vassago with the frame. Sounds excellent! Which frame are you getting? 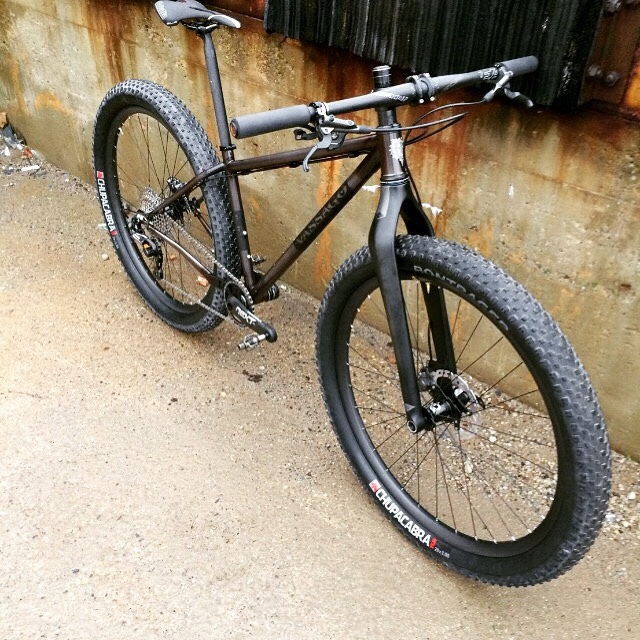 boost jabber with a rigid fork!!! 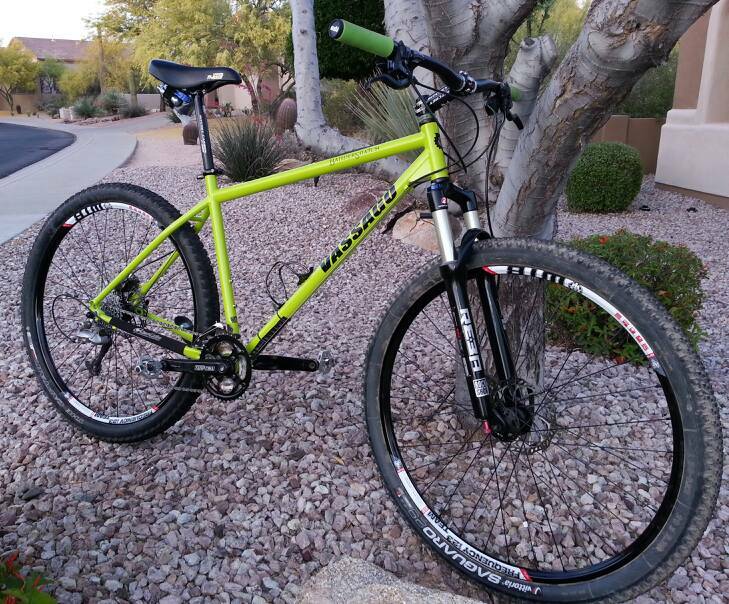 i had an old green jabber but sold it 2 years ago. 1. 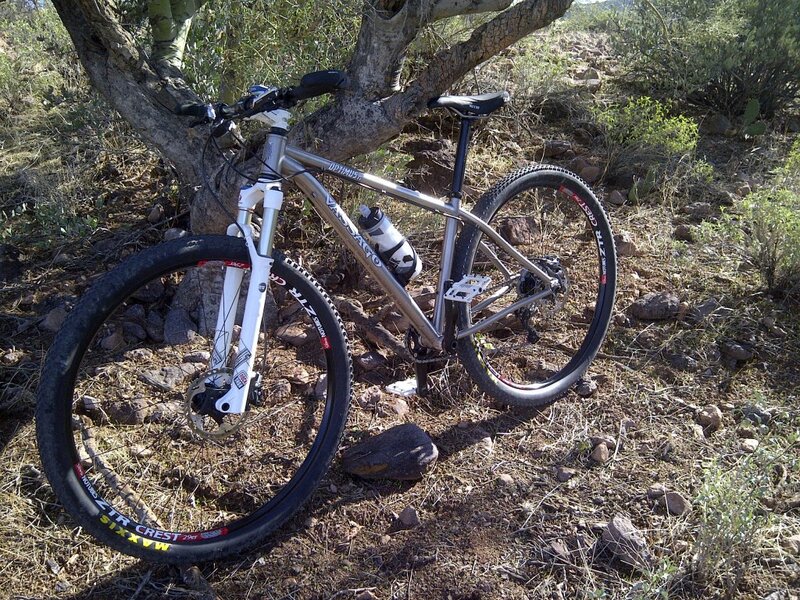 27.5+ front and rear: 130-140mm. 2. 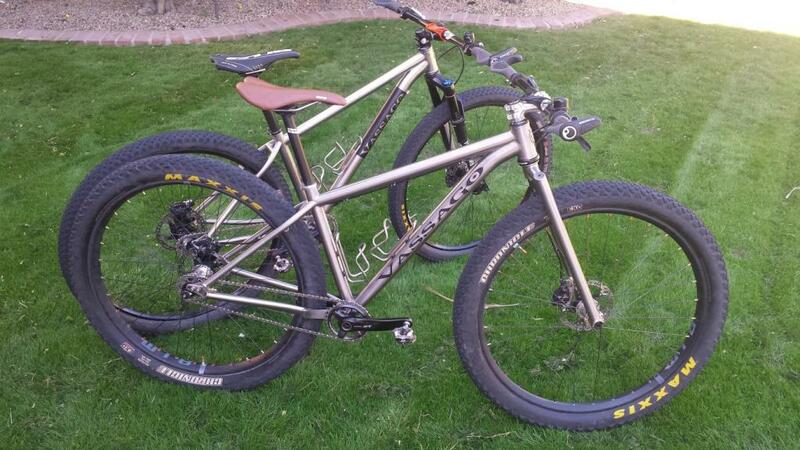 Normal 29er front and rear: 120mm. 3. 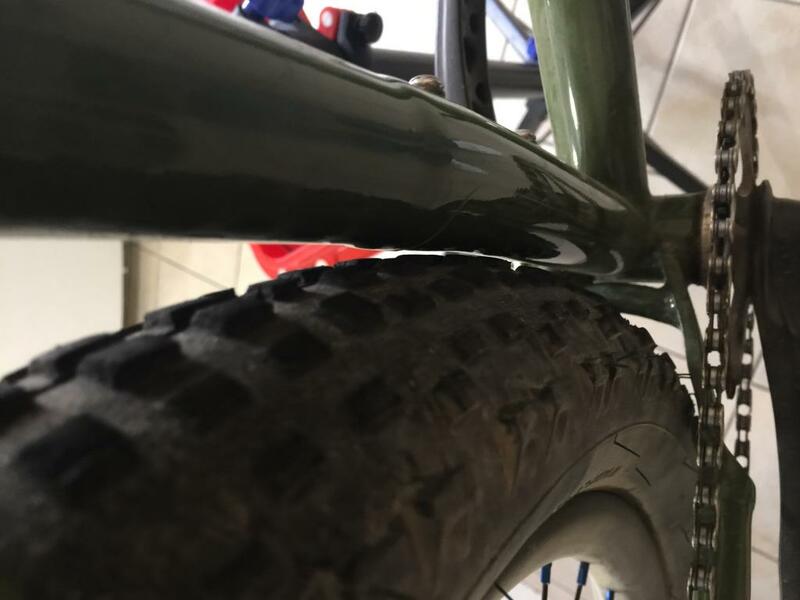 29+ front and rear: 100mm. 4. 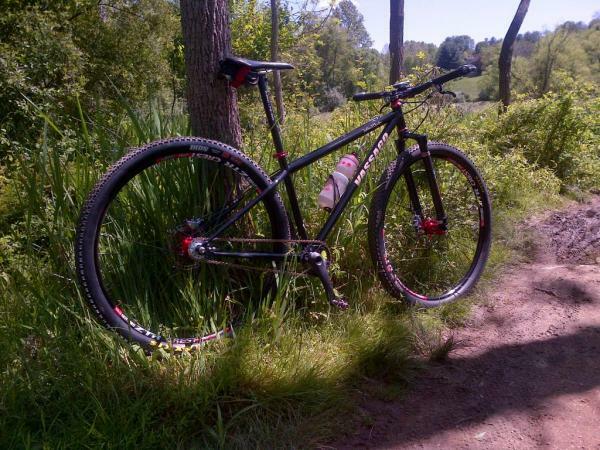 29+ front and 27.5+ rear: "not recommended… but probably a 80-100mm fork if you did it" - Tom. Has anyone here ever asked Tom for a custom paint job? I'd tell you what color the new model is going to be, but I'd probably get in trouble for it! I already know the first batch of Verhauens will be raw tempered steel with a clear coat. Heck, I even posted photos of it earlier in this thread. If I choose to go with the steel instead of Ti, though, I just have a few pallette ideas of my own. It's not mandatory to get the color I want, but it would be an awesome bonus if I could -- and I'm willing to pay extra, of course. Was just a thought. I'll call him on Monday to explore the idea. I can't tell you, the name breaks forum rules. I got into trouble already about it. Are you saying there is another new model besides the updated Jabberwocky, Verhauen, Optimus Ti, and Mooseknuckle? There's supposed to be, but I'm not sure when it's coming out. I haven't heard about that last one you mentioned. 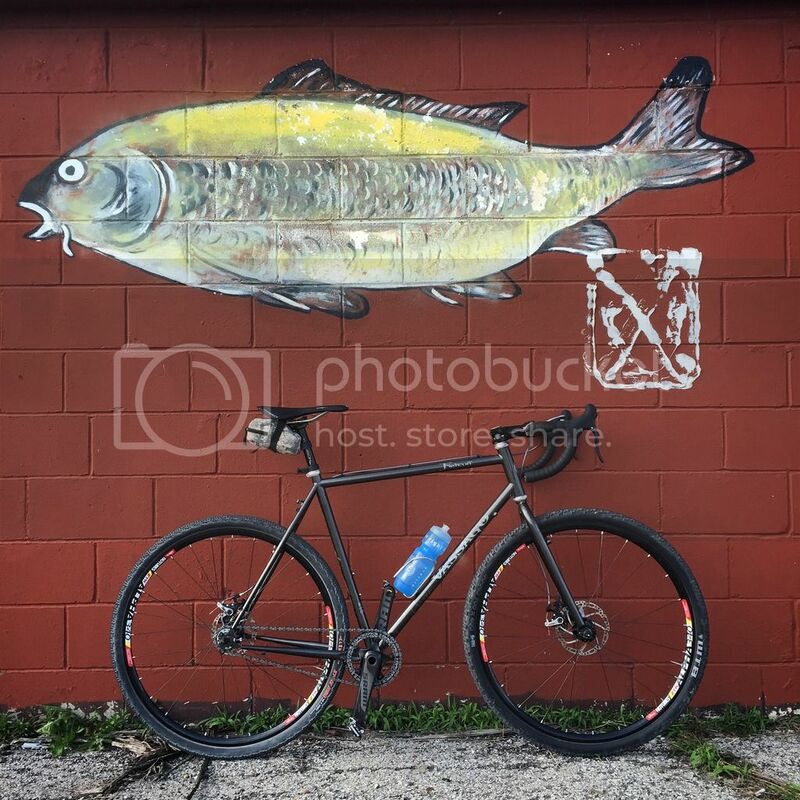 There are already several Mooseknuckles in the wild -- they started trickling out last month, and they're all over the Vassagocycles Instagram. It's a titanium frame with the same geo as the updated Verhauen and Optimus Ti. The photos below should tell you how it got its name. Oh, that is beautiful! Be careful with that name. A certain moderator may think you're talking about something else. Looks like Columbus tubing on the new Verhauen? What's with all the bottle mounts? What's with all the bottle mounts? 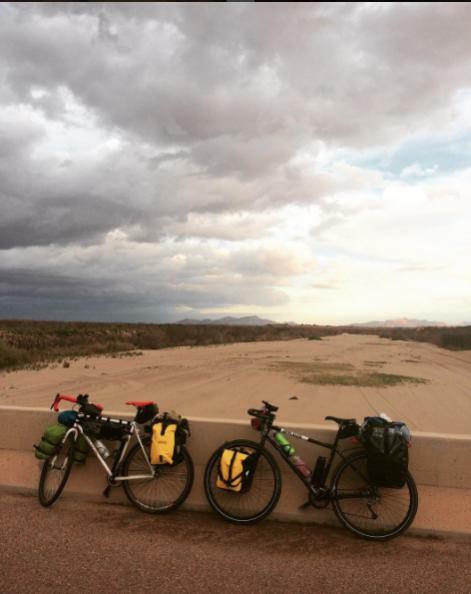 Extra mounts for bikepacking setups, or just extra water for epics. Tried calling for an update this afternoon. No answer. Stumbled across the Vassago TKO on their web page the other day and it checks a lot of boxes. Not available in my size right now. Anyone know if they're going to restock? Or is it a custom order item only? Or are they gone, gone, gone? I see why they call it the Mooseknuckle! 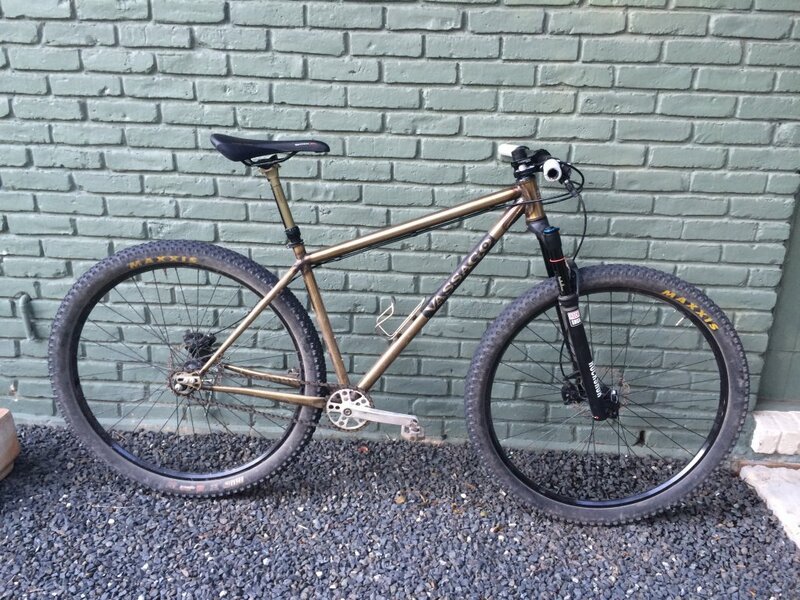 mooseknuckle frame is $2100 USD for anyone curious. Yeah, it's getting me all knuckled up. 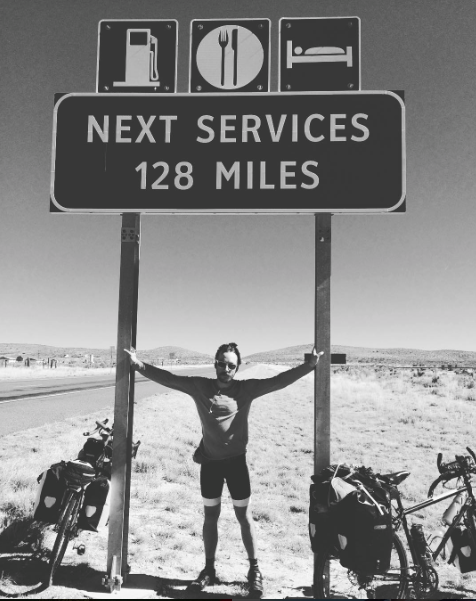 Have you chronicled your journey anywhere? Just day to day snippets on instagram...never been much of a blogger so I figured if I started one up just for this trip it wouldn't gain much traction without an already established audience. Plus to be honest it was just a shitload of boring road riding. If it had been remote and gravellicous the whole way I'd probably have more to say. 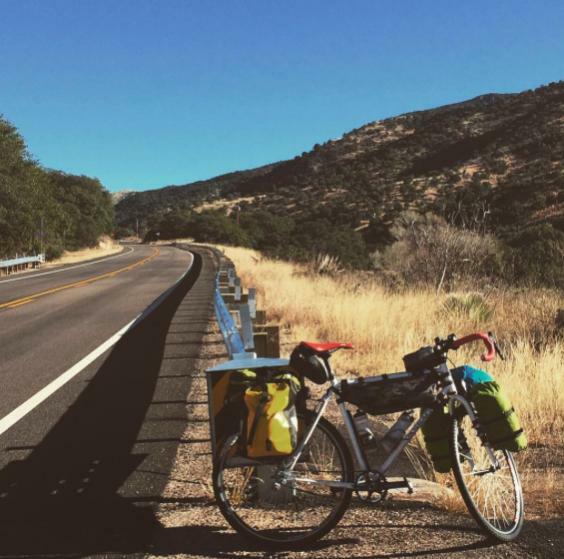 I think people would be interested, if you started a thread with pictures and a story of your journey. It would be inspiring for people. Any updates on all the new 2017 goodies? I'd like a full 2017 Verhauen geometry table if anyone has one. 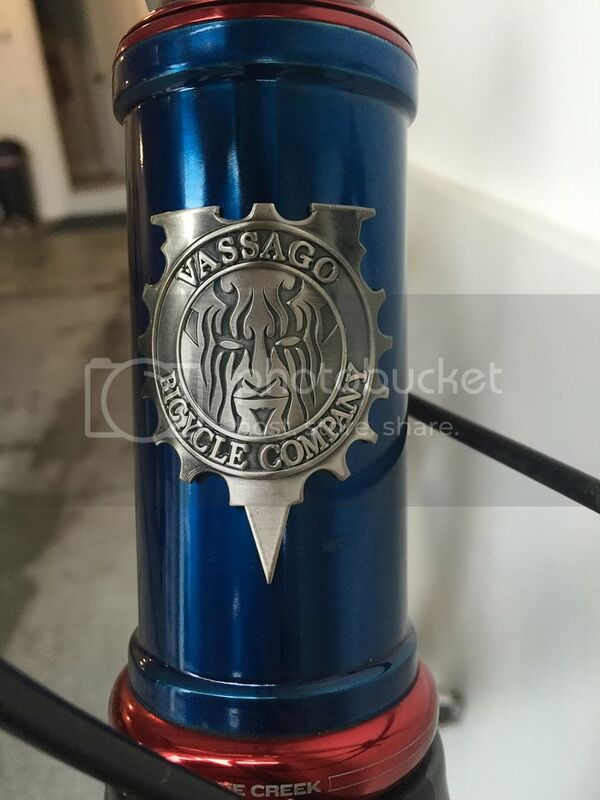 Will also be interested in full details on Optimus and Mooseknuckle when they get up on the Vassago site. All three of those frames will now share the same geo. The last word I got from Tom was that the new Verhauen and Optimus frames are due in next week ("last week of March"), and he plans to launch the new website with all the updated details the day they arrive. hehee...posted w/o checking their site. new jabbers are in and for sale. The first batch of the other new frames arrived, as well. I got the notification from Tom for my new Optimus last week. wonder if there are any slight geo tweaks to the jabber...i'm pretty sure there'll be no XL option on the jabber per an earlier message from Tom. I'm standing by for a 2017 Donnybrook. Tom didn't know the colors a few weeks ago. I don't really care. I have a box full of parts and a wheel set that need to be installed so I can't wait. Good to see fellow Vassogians having a chat about some great bikes! 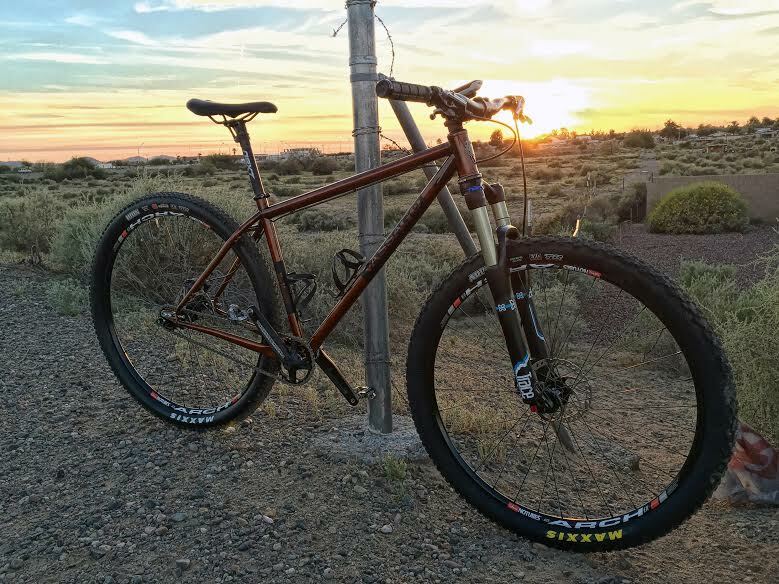 I've ridden my VerHauen SS with a 27.5+ "conversion" wheelset (Blunt 35s with WTB trailblazer 2.8s) and it works pretty well. The trailblazers fit easily, they are very tall and not that wide. It's a fun setup, more grip in most situations, the Trailblazers are a bit finicky with pressure. 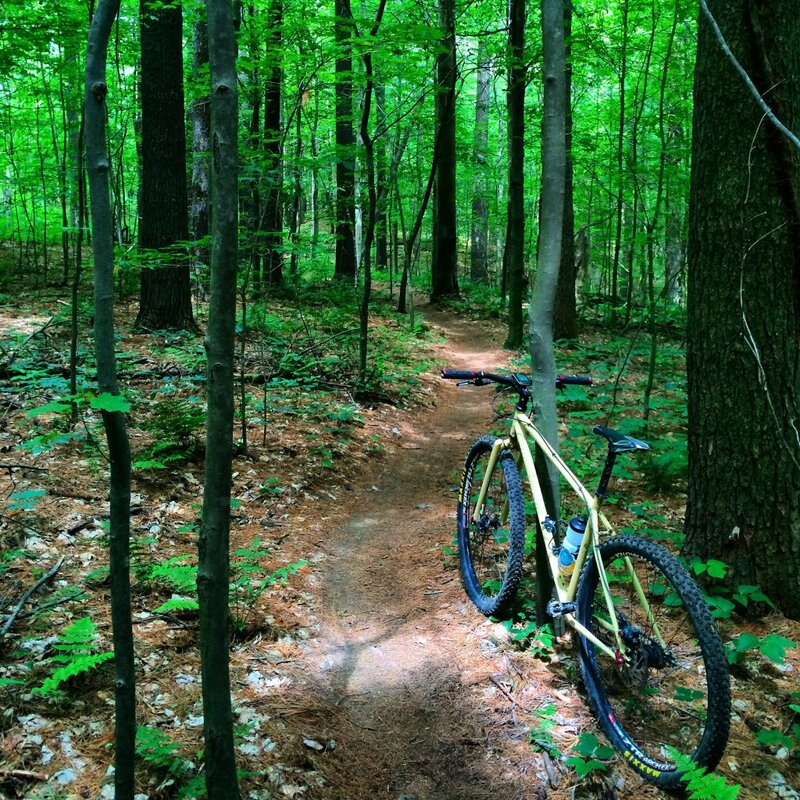 Handling is a little sharper, I assume because of the reduced trail. 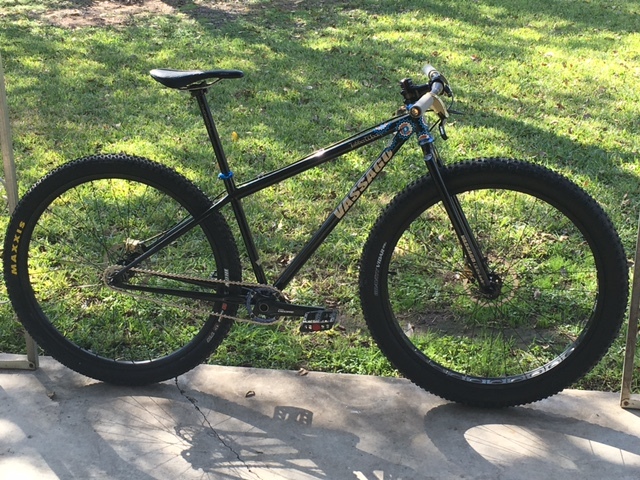 I have a Verfetten as well that I've converted to a "real" 27.5 plus bike, I'm still dialing in the cockpit, but it's loads of fun. For another data point, i have one of the new boost frames and my 29" chupa ona 39mm internal rim needs to be roughly 3/4s of the way back on the slider in order to roll with a couple mils of clearance from the CS. 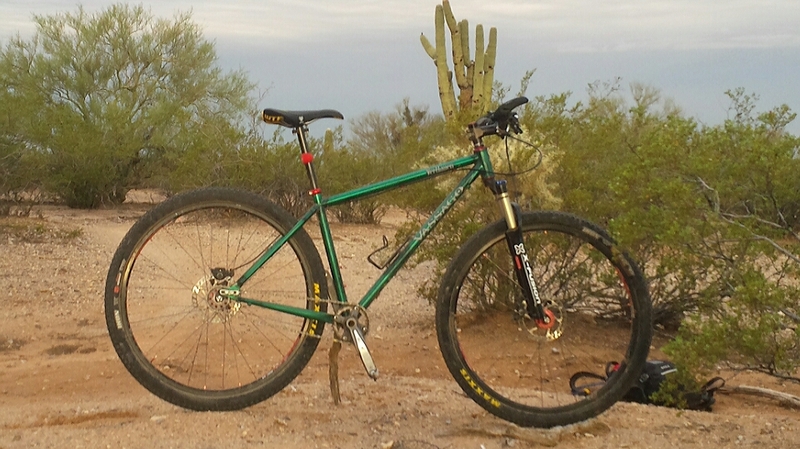 Planning to put some 29x3" Chupacabras on when the LBS has some in stock (29x2.4" Trailboss on there currently). Does anybody know what's happened with Vassago? There was lots of chatter back in the spring about the new VerHauen, etc. but I haven't seen anything since March. Their site seems to have newer frames like the MooseKnuckle, but the VerHauens are the old style. There isn't really a "new" or "old" VerHauen. The geometry hasn't changed, it's just new colors, as far as I'm aware. The "new" was just making the Jabber accommodate 3.0's and adding the MooseKnuckle. 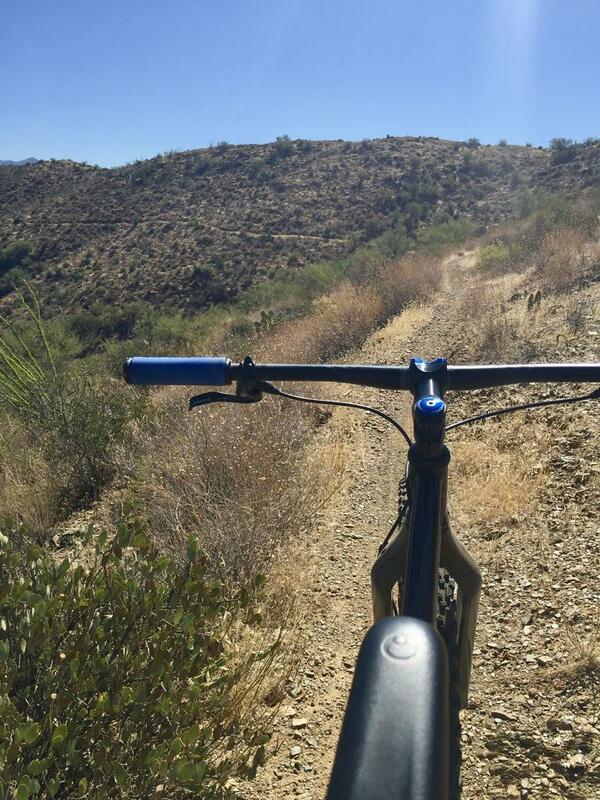 Not entirely true, because True Temper stopped making steel tubing for bicycle frames, the new VerHauen frames are made from Columbus tubing. 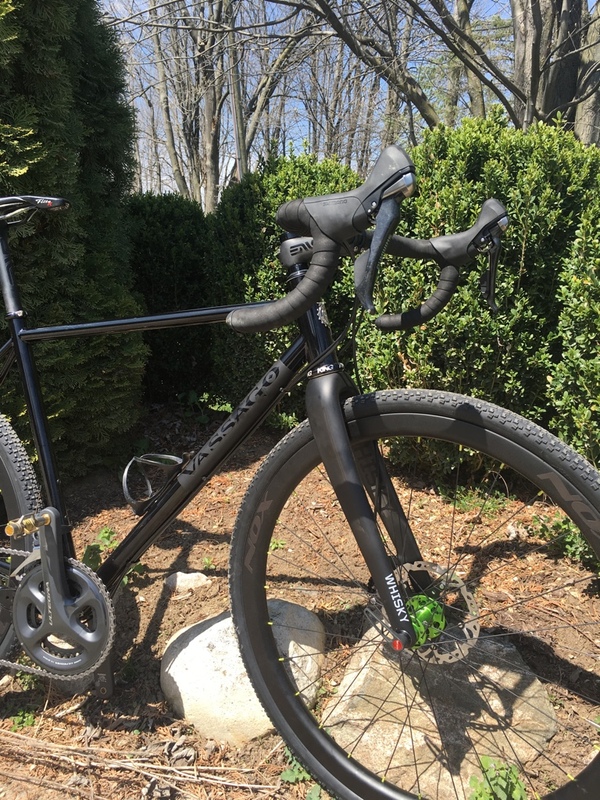 The new geometry looks like it's been changed to slacker front and shorter rear. 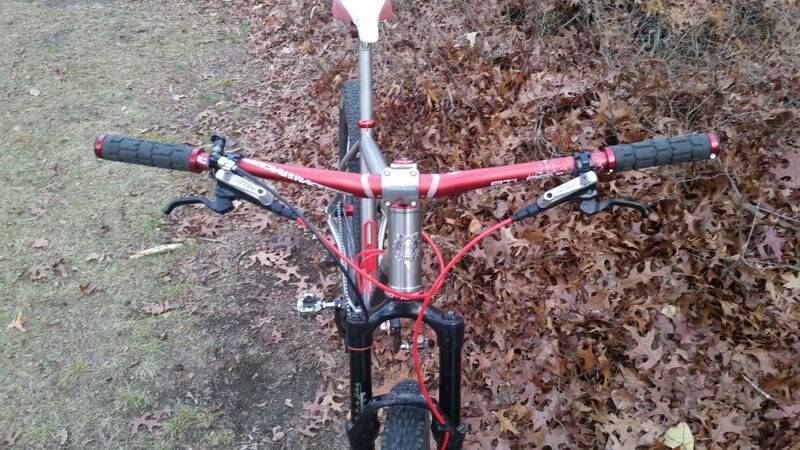 Boost spacing and lots of bottle mounts appear to be targeted at the bike-packer crowd. The newer MooseKnuckle, Verhauen, and Optimus frames all now share the identical updated geo with more flexibility to run 27.5+/29/29+. My beloved Jabberwocky recently met an untimely end with a crack at the toptube/headtube weld. Unfortunate and unexpected, but after a handful of emails with Tom, I was graciously granted the opportunity to pay just a bit out of pocket and upgraded not only from a small frame to a medium frame (I'm 5'9) but from a Jabber to a VerHauen. 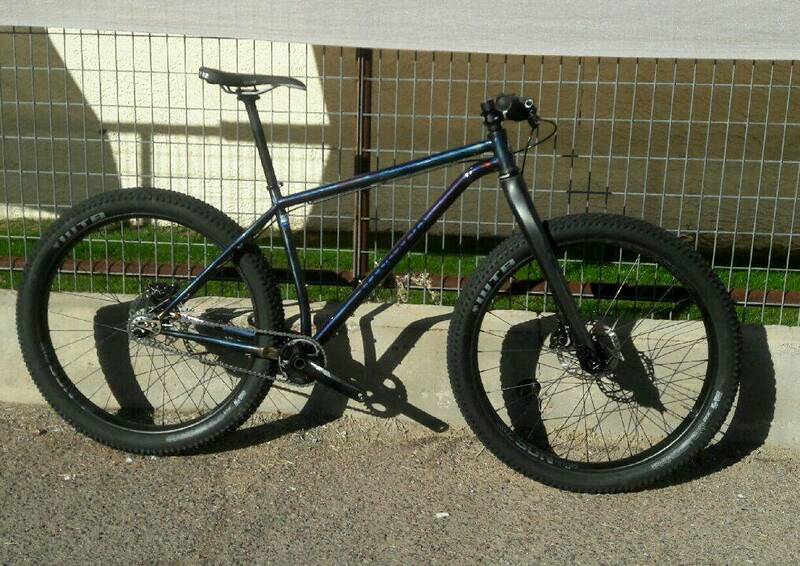 I dropped off the broken frame at a local shop where the new one was waiting for me,and built it up last Thursday. 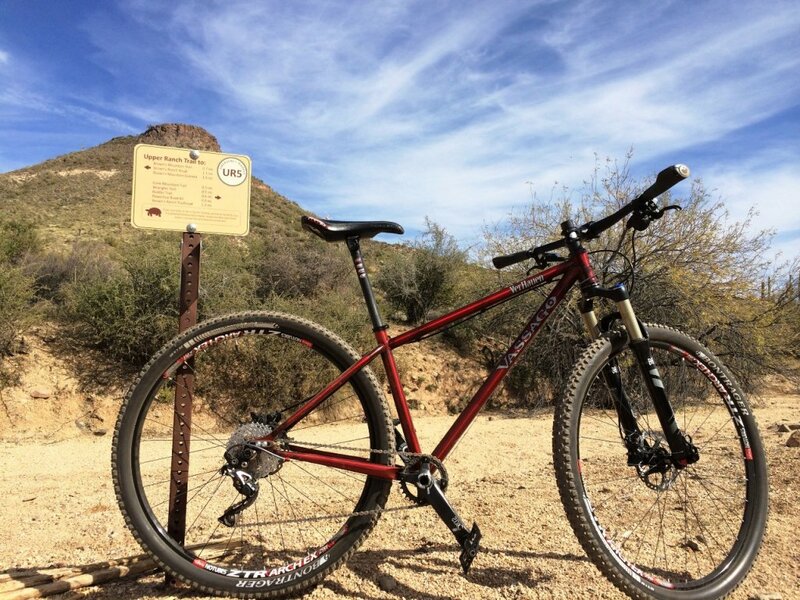 It got a 18mile/2500' climbing Maiden Voyage on Saturday on the Black Canyon Trail. Upsizing to a medium was the right move. I'm digging the 15mm longer ett, and have much more room for bottles. Could be a little confirmation bias, but I swear the premium Columbus steel rides a little nicer too. It's definitely lighter. Even a size bigger the frame is 1.5 lbs lighter. So Vassago has the new Columbus tubed VerHauens for sale? There web site only lists the old gen True Temper models. 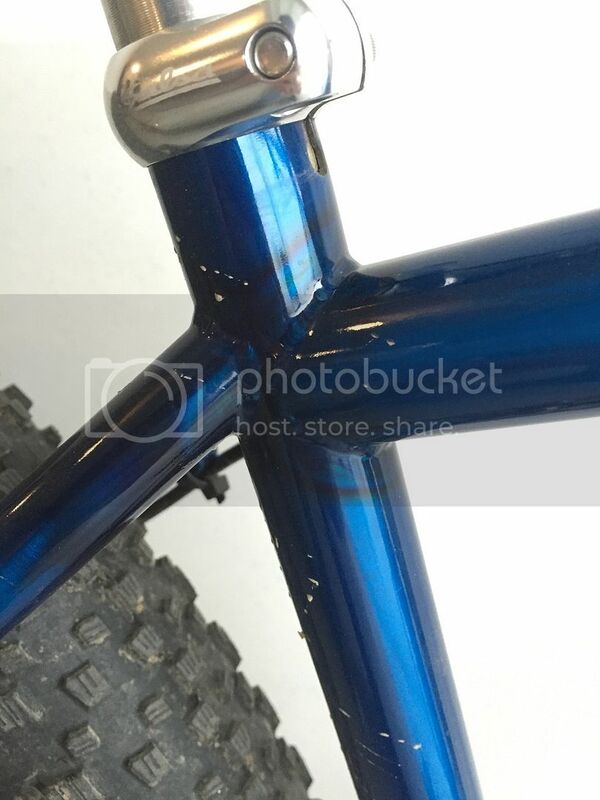 I haven't seen any pictures of the new frame since the spring, and they were a funky clear multi-color. Definitely for sale. 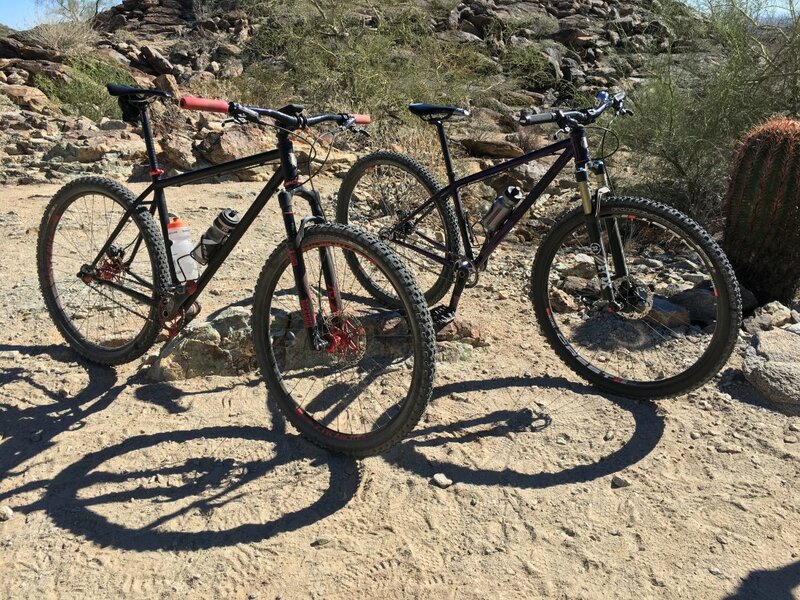 I've crossed paths with two others here in Phoenix, as well as seen pics of them in the 27.5+/29+ bike FB group. One of them is even in the UK. It's my understanding that TrueTemper stopped making OX platinum (shrug?) so a new material was chosen. The first run of the heat-treated/clearcoated ones had a little columbus bird on them denoting the change in supplier. Mine has no sticker and is gloss black, with matte black logos. Tom told me that was a limited run and all out of stock. I love Vassago. 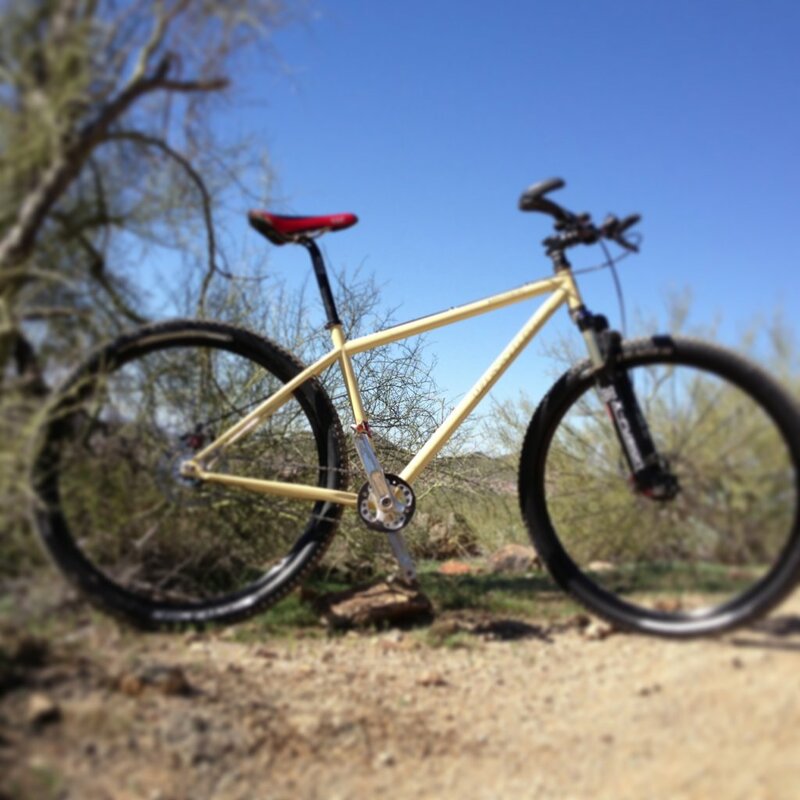 I wanted one for years before I bought my Jabberwocky last year, and they've got cult status here in PHX partly because the owner lives/operates here and frequents a local shop (ShadeTree bikes). For me, they live up to the hype, and I would buy one again in a heartbeat. I recognize, **and have said directly to him**, that his website and his difficulties getting customer service streamlined are hampering his success. He operates as if he were (is) a one-man operation. Maybe he is, maybe he's not. I don't know. 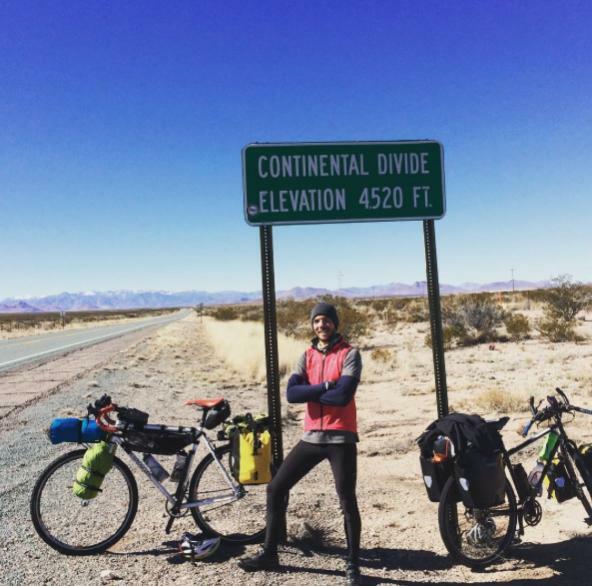 I exchanged probably a dozen emails with him, and he always replied within 24-36 hours even on the weekend, but again, establishing a line of contact may have well been because of my location, and that I have friends that race for Vassago. I have wondered how much of my 'love' for Vassago is due to my location and the fact that I can literally get face to face with Tom if I need to. If I were in Oregon, or New York or Florida I can't say if I'd have the same feeling. 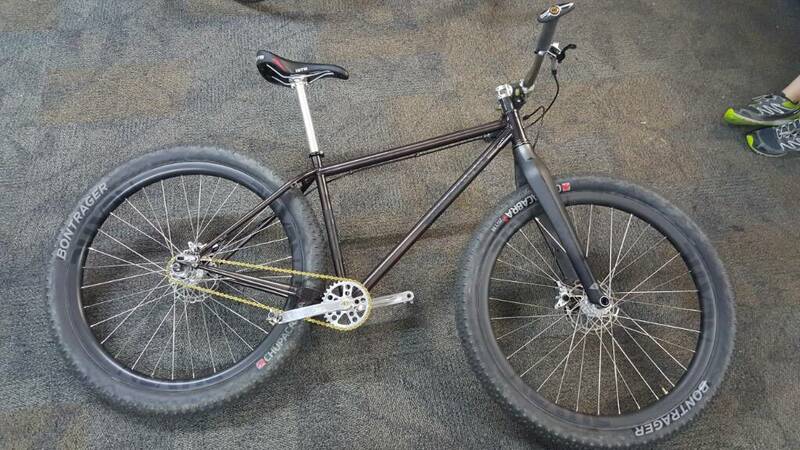 Edit: in case any closet weight weenies were curious, the bike weighs 23.4lbs as pictured- 4oz of sealant in each 1000g Chronicle, 2 burly alloy cages, 22t steel Surly cog and super thick lock-on grips included. Could be into the 22's easily with a little work. Here's my Bandersnatch. I've had it maybe 4 years now. For most of that time, it sat ignored and lonely as I was busy riding my Krampus. 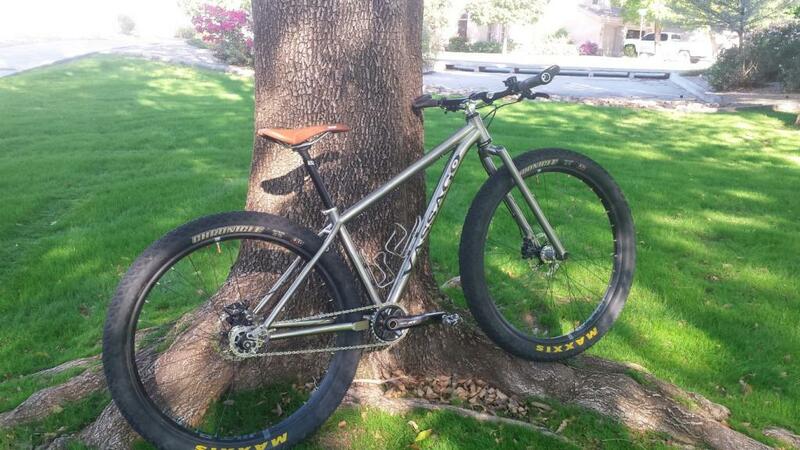 But, I just added a Whisky #9 fork and a new set of wheels (DT 350 hubs, Spank Oozy 295 rims. Loving this thing again. 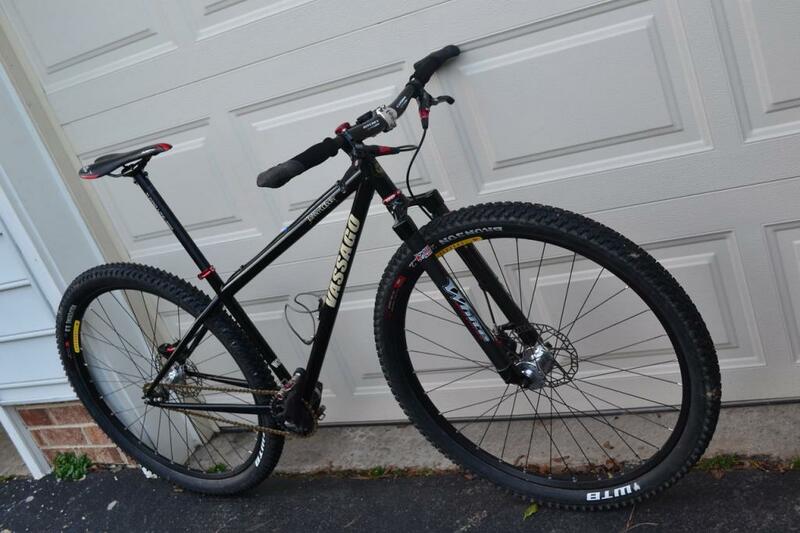 Great all-around XC bike. Not the best photo. Prior to building the new wheels. Per Tom via a FB messenger conversation on Monday, all the 2017 frames have the same geometry, which is is that of the updated Jabberwocky, which matches what Paleh0rse posted above. He operates as if he were (is) a one-man operation. Maybe he is, maybe he's not. I don't know. I contacted Vassago through their website, and tried to find a phone number. Google gave one, but the voice mail didn't even confirm it was actually the right place, so I didn't leave a message. I see you mentioned giving Tom a call in several posts. Is there a good number where he can be reached? 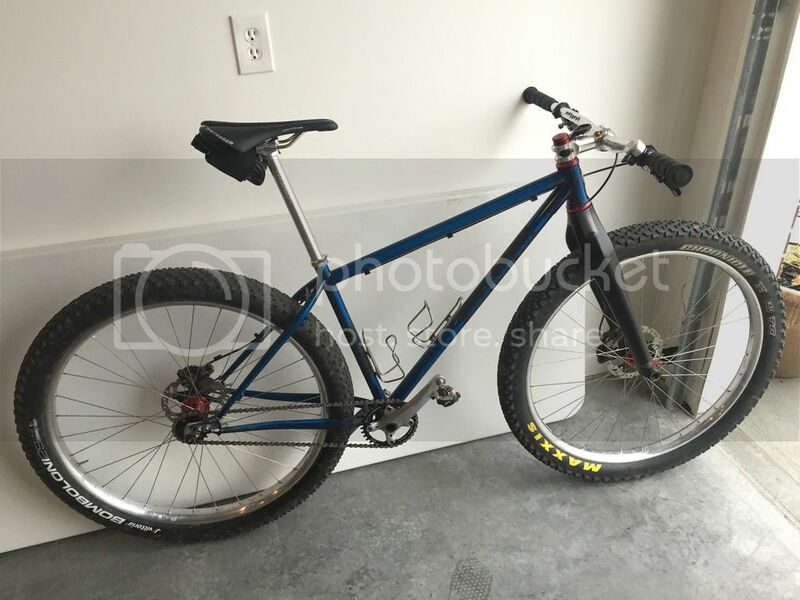 My Krampus is too small, and I'm trying to find the right frameset to replace it. 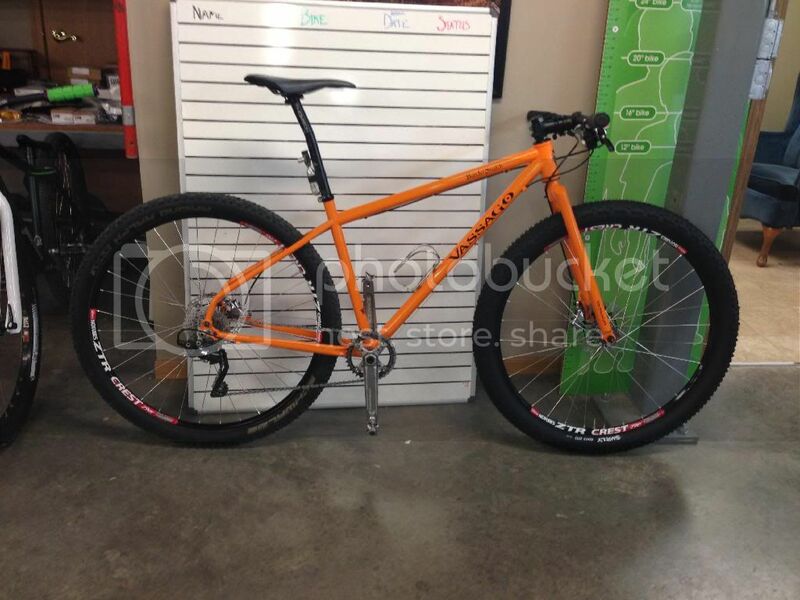 Thinking about a Vassago instead of another Krampus, just because that is a lot of money to spend on a Surly when I could have something a little more special. And because there are a couple of key geometry differences (But I do like the Krampus). My Krampus does not have TA's, just old-style quick releases. 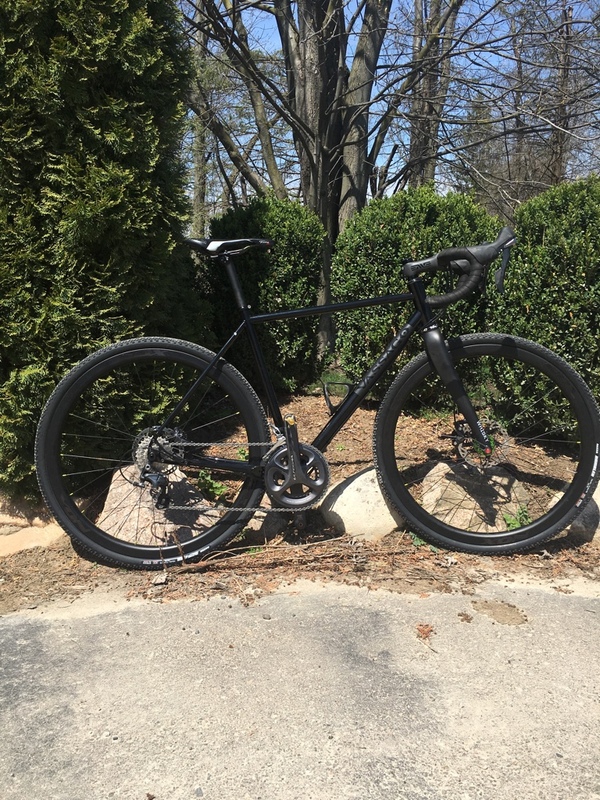 I built with Velocity P 35's, and did a single speed conversion. 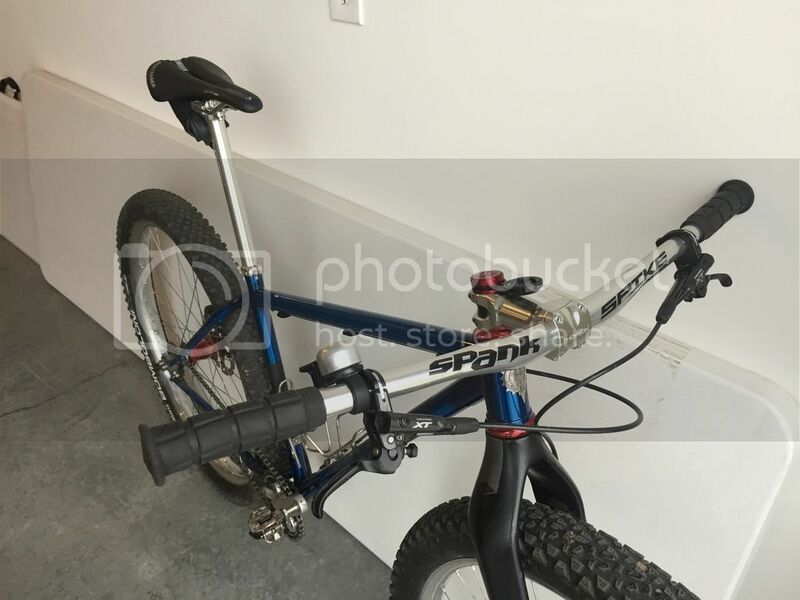 I don't want a dedicated SS bike, just want that for now. 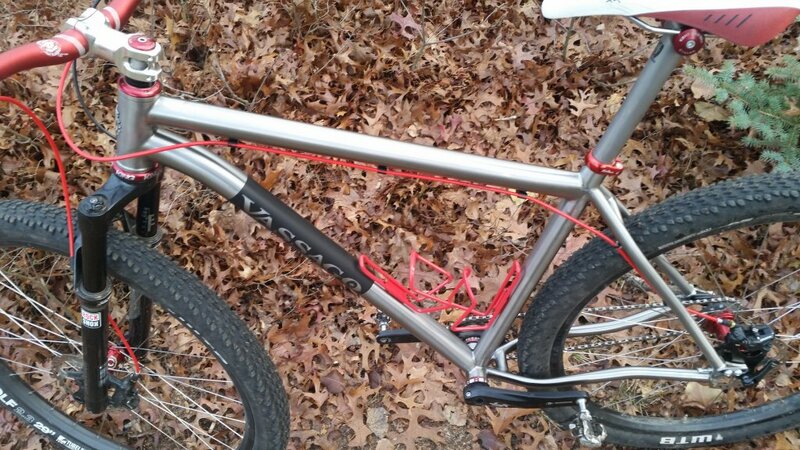 Also, the effective top tubes are slightly longer than the Krampus, but reach isn't listed. Can anyone comment on stack and reach compared to a Krampus? I wouldn't mind more stack. Last, which is the difference between the Jabberwocky and the Verhauen, besides price?